Gas or air bubbles in a joint space are most commonly associated with the “vacuum phenomenon,” a collection of gas that has precipitated out of solution to take up a gaseous state within a joint. This phenomenon was unbeknown to us upon a patient presentation, seen on computed tomography scan, and so further academic investigation was performed to define this pathology. Because of this lack of awareness, a PubMed® literature review was performed to analyze the rate of incidence in foot and ankle. 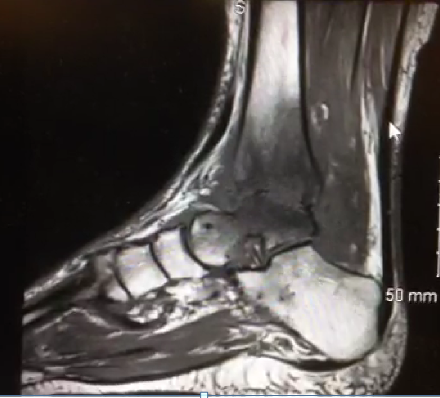 Additionally, we present a case example of the vacuum phenomenon in the ankle joint of a 50-year old patient presenting with degenerative ankle joint pain symptoms. Further, a review of the condition as well as differentials is discussed in an attempt to raise awareness of this differential diagnosis for gas bubbles within a joint. 1 – Fellowship-Trained Foot and Ankle Surgeon, Premier Orthopaedics and Sports Medicine, Malvern PA.
2 – Resident, PGY-2, Bryn Mawr Hospital PMSR/RRA, Bryn Mawr PA.
3 – Private practice, Ocean County Foot & Ankle Surgical Associates, P.C., Toms River NJ and The Foot and Ankle Center, Haverford PA.
4 – Residency Director, Bryn Mawr Hospital PMSR/RRA, Bryn Mawr PA and Private Practice, Wayne PA. The presence of gas or air bubbles in a joint was first described by Fick in 1910 when he noticed gas bubbles in hand joints on radiograph (XR) evaluation while under traction [1-3]. Later this radiographic finding was coined the “vacuum phenomenon” (VP) by Magnusson in 1937 . 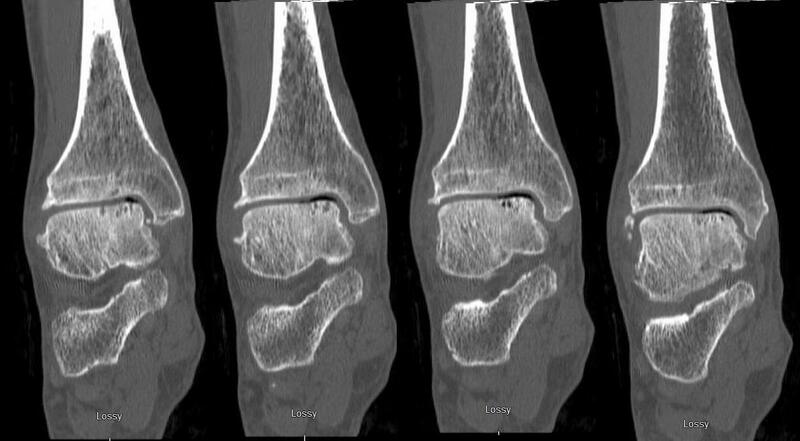 On imaging modalities such as computed tomography (CT) where it is most often visualized, it appears as a dark radiolucent pattern that can be shaped anywhere between a singular, linear bubble to confluence of bubbles within the confines of a joint space . The shape is classically defined as a crescentic lucency paralleling a joint when found articular . Gas bubbles were first thought to be associated with joint traction or trauma, but has since been found in situations of degenerative changes to joints [1,2]. Other associated gas bubble presenting pathologies include fracture-dislocation (e.g. traction injuries, open injuries introducing free air), ligament injury, metastasis, infection (e.g., abscess, osteomyelitis), cancer (e.g., multiple myeloma), intervertebral disc herniation/Schmorl’s nodes, abdominal or thoracic free air (e.g., digestive tract perforation, pneumothorax, air embolism), decompression sickness, and iatrogenic causes (e.g., surgical introduction of air, arthroscopy) [2,4]. Related to degenerative disease, its presence is most often cited to the sacroiliac (SI) joints (i.e., joint, facets, intervertebral discs) but also has been found in the pubic symphysis, lumbosacral space, and the joints of the temporomandibular, wrist, hand, hip, shoulder, knee, ankle (AKJ), subtalar (STJ), and calcaneocuboid (CCJ) [1-4]. Analysis of the gas in the SI location has found it to be predominantly nitrogen (> 90%) based , but oxygen and carbon dioxide among other gases are also present at much lower concentrations . The purpose of this report was twofold: to determine the rate of occurrence of foot and/or ankle VP in the literature through a keyword search and present a case example of the VP to the AKJ in an end-stage degeneration clinical situation. A PubMed® advanced keyword search was performed on May 1, 2017, using the term combinations of “air bubble,” “bubble,” “gaseous degeneration,” “vacuum phenomenon,” with “foot” or “ankle.” The search had no restriction parameter fields applied. (Table 1) The returned abstracts were reviewed to determine their validity whether relevant to the primary search goal of obtaining articles demonstrating the VP from the ankle joint, distally. A table was then created counting the published instances of the VP in the foot and/or ankle. 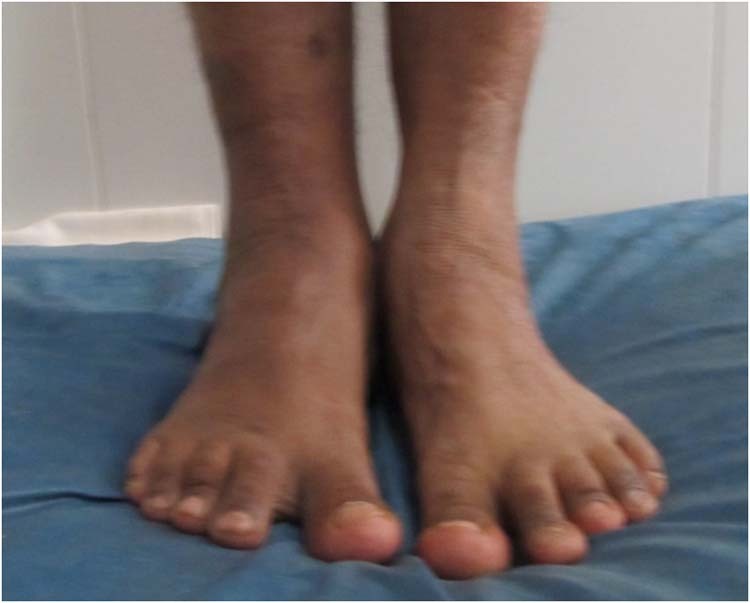 A 50-year old male patient presents to the senior author’s office after referral from a previous podiatrist due to his primary complaint of ankle pain. The patient described the pain as a progressive pain upon ambulation. The patient is very active and enjoys running and mountain climbing in particular. He states he can walk up to 8 miles until he can’t bare the pain anymore. He states his pain has been progressing in the ankle for 8 years now. Only rest has been able to alleviate his symptoms to this point in time. He has not sought any formal medical treatment prior to presentation. 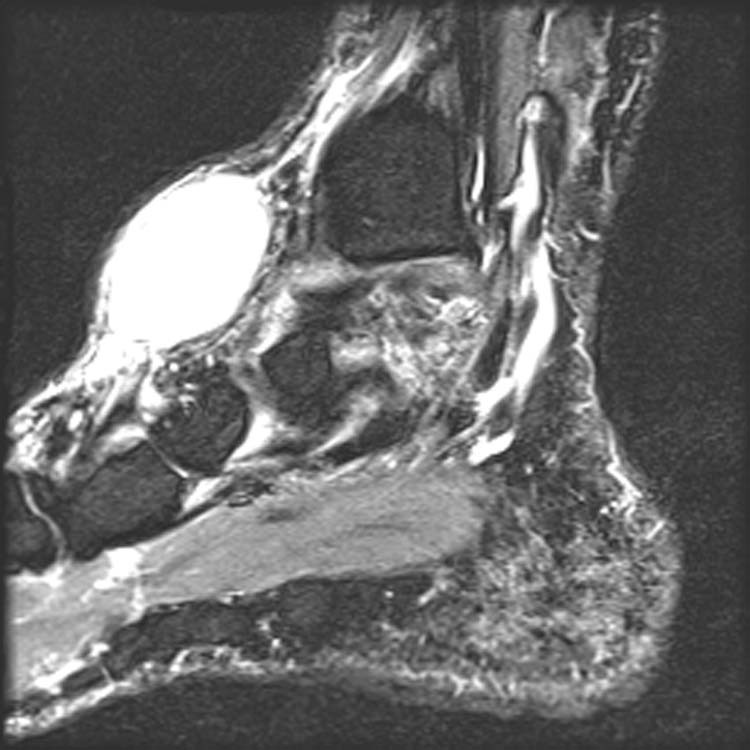 Figure 1 50 year-old male, sagittal CT scan of the ankle. Note the gas formation in the joint as well as presence within the subchondral bone region. Associated talar dome arthritic changes. Images are left to right, lateral to medial. 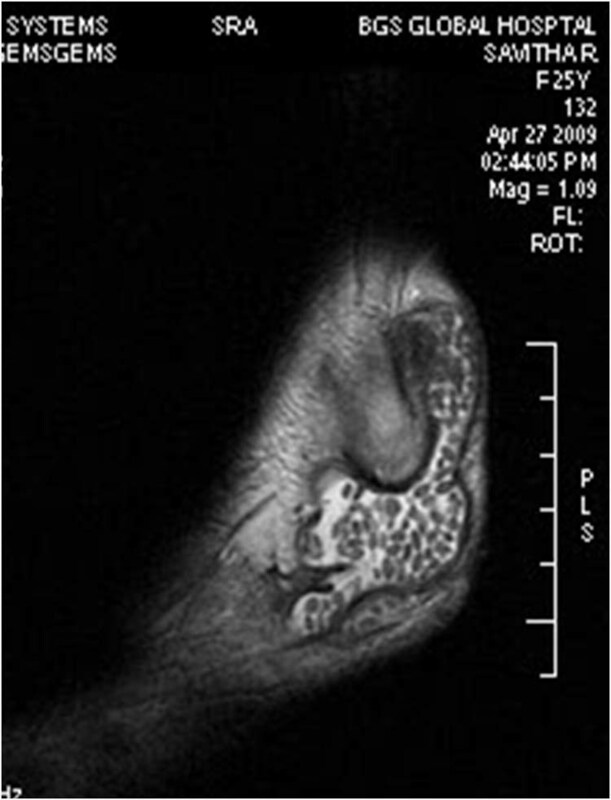 Figure 2 50 year-old male, coronal CT scan of the ankle. Note the gas formation centered around, and within the cystic changes to the medial talar dome. Images are left to right, anterior to posterior. Figure 3 50-year-old male, axial CT scan of the ankle. Note the gas formation is positioned with the lower-lying cartilage defect space. Images are left to right, superior to inferior slices. Table 1 Key Word Search Parameters for Study Identification – Vacuum Phenomenon to the Foot and/or Ankle. Table 2 Study Search Resulted Literature – Vacuum Phenomenon to the Foot and/or Ankle. The patient’s past medical history consists of hemochromatosis. There is no known past surgical history to the foot or ankle. There is no known family history of foot or ankle pathologies at this time. Medications consist of hydrochlorothiazide and a baby aspirin daily. The patient’s physical exam findings show limited dorsiflexion at the ankle joint and pain upon end range of motion in dorsiflexion at the ankle joint with a hard stop. His neurovascular status was grossly intact. There were no subjective complaints or objective findings of an infectious process based on the history and physical exam. He had no complaints of any other arthritic or painful joints. No other abnormalities were noted to his problem based exam. A CT scan of the ankle exhibited degenerative joint disease to the talotibial joint along with a large anterior osteophyte of the distal tibia and talar neck at the ankle joint level. The CT scan also exhibited intra-articular gas centrally within the joint (Figures 1-3). Upon discussion with the reading radiologist it was declared that the gas was related to the VP. Further discussion with multiple facility radiologists where the study was performed revealed that the gas is due to nitrous oxide from surrounding synovial tissues, but can also be due to positioning of the ankle joint at the time of the study. From their experience, most VPs noted by these radiologists occur primarily in the lumbar spine and shoulders. None of them have seen such a finding in the ankle until this particular case. 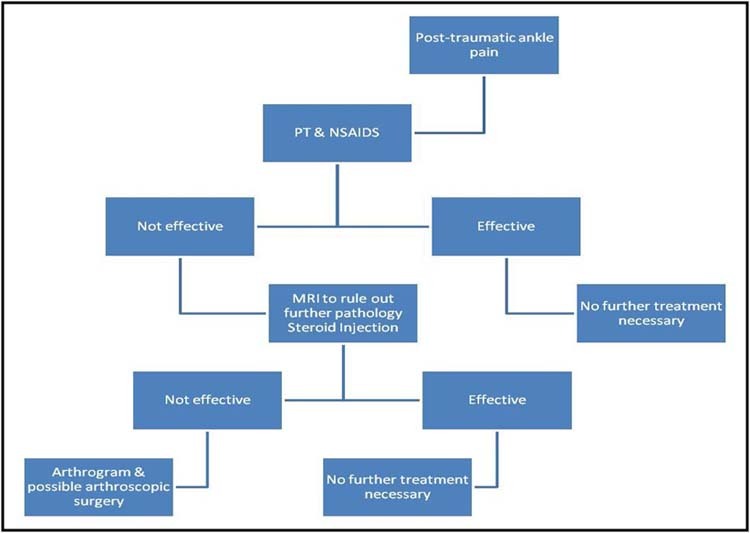 Discussion of treatment options with the patient included less impacting exercises, an anterior ankle joint arthroplasty, and the need for a possible ankle joint replacement in the long term future. The patient was in favor of the anterior ankle arthroplasty procedure but would take time to think about his options moving forward. No treatments have been rendered to date and he has not returned to the senior authors’ facility. From the PubMed® literature search, 33 articles resulted in total. After reviewing titles, abstracts, and database tags, removing irrelevant and duplicate entries, only two articles were relevant to this literature review of identifying examples of the VP in the foot and/or ankle (Table 2). This included a retrospective institutional review of CT imaging over two years evaluating the presence of gas bubbles in the lower extremity joints (i.e., AKJ, STJ, CCJ) and a case example of the VP in the STJ and CCJ after a trauma [1,5]. A third study found discussed a drop foot secondary to epidural gas formation and nerve root compression was not counted due to the distance location of the gas bubbles from the foot . The VP is a combination of anatomy and physics, calling into play both Henry’s Law and Boyle’s Law through hydrodynamic cavitation [2,4]. Simply put, gas precipitates out of solution through a negative intra-articular pressure when a joint is distended (e.g. traction) or collapses. The newly created free space within the joint capsule needs to be filled, and is done so by gas (primarily nitrogen) [2,3]. In this situation it is often by a gaseous element that precipitates out of the local tissue or synovial fluid due to changes in pressure [1,2,4]. Gohil et al (2014) and Yanagawa et al (2016) provide detailed explanations of this phenomenon. Normally, this gas goes back into solution when the joint returns to its normal volume and pressure. However in situations of arthritis, a thickened or fibrotic/scarred joint capsule does not allow the gas to dissolve out. Furthermore, excess joint space due to the presence of cartilage loss and subchondral cysts allows the gas to remain out of solution to fill that “extra” space . In situations of traction or trauma to a joint, the blood gas nitrogen precipitates out of solution to fill the excess free intra-articular space from the joints’ distention . In open fractures, the outside air fills the spaces within the extremity, and is not a true VP. The presence of the VP may be seen as something no more than an academic finding when present on a CT scan of a lower extremity joint. It has been documented in instances related to trauma (i.e. sprain; joint dislocation; rapid joint distention,) degenerative disease, osteochondrosis, osteonecrosis, idiopathic, osteomyelitis / infection, or conditions specific to the joint found in [1,2,5]. Its finding is most often related to degenerative disease to a joint, easily seen on CT due to its greater sensitivity with higher resolution compared to XR or magnetic resonance imaging (MRI) [1,2,4]. Associated pathology such as narrowed space, subchondral cyst, sclerosis, hypertropic degeneration to the joint may be seen along with the gas bubbles in degenerative situations across each imaging modality. In acute trauma, the presence of gas would suggest intact joint capsule and the associated intra-capsular ligaments however reports in the knee have shown otherwise . When found, one important point is to correlate the finding to the presenting pathology through the patient history and physical exam so to not over or under diagnose the true pathology at hand [2,3]. This is most important when wanting to rule out any potential infectious processes such as septic joint, open fracture-dislocation, or penetrating joint trauma. Joint gas and spinal infection has been associated with bacteria such as obligate anaerobes or facultative organisms such as clostridia, Peptococcus, and E. coli [1,7]. Patterns of gas formation have been cited with different pathology from a linear formation in more benign pathology while bubble-like multi-lobulated patterns suggest infection . In closed injuries, the presence may suggest a recent joint dislocation that otherwise may not be visible on imaging . Specific to the lower extremity, Lee et al. (1994) performed an institutional retrospective review of CT scans over a two year period to determine the incidence of gas within the STJ and/or AKJ . It was documented in 12 cases (n = 495, 2.4%) on CT, none of which were related to infection. Of these, 11 were in situations of arthritis (post-traumatic, 10; non-traumatic, 1), 10 cases in the STJ, and although the XR did not show gas or air in the joints, degenerative changes were present and visible on both XR and CT. In the only other example, Ahmad et al. (2007) demonstrated the VP in a single case of an acute, closed STJ and CCJ fracture-dislocation . One final unrelated but interesting case included epidural gas collection secondary to vertebral disc degeneration causing nerve root compression and a drop foot . Ultimately, surgical decompression resulted in resolution of the drop foot. The VP is very under-reported in the literature and in radiology reports . In the SI joint where the finding is most common, one study found only a 16% reported rate . For the case presented here, the finding was not mentioned in the radiologists report. Only in calling the radiologist who performed the evaluation did we get an explanation of the gas finding seen on CT. The condition may be unfamiliar to physicians other than radiologist, as was in this instance, where more awareness would be important for the ordering physician to add the VP to their differential diagnosis of gas in a joint without jumping directly to infection [2,7]. The authors surmised the VP finding in the lower extremity may not be seen in high percentages due to two more reasons. These are based on the physics of the VP and some speculation . The first is that the VP is most sensitive on CT imaging. In instances of acute trauma to the lower extremity such as traction injuries (i.e. sprains) that are often evaluated, diagnoses, and treated in the outpatient setting, an MRI is often the modality used if advanced imaging is required. In these traumatized joints, by the time imaging is performed, the gas has possibly gone back into solution and fluid fills any remaining excess intra-articular space. In acute injury settings such as joint dislocations, it has been suggests that gas bubbles may be routinely seen within 4 hours of dislocation while occasionally seen after 48 hours on CT scan . Another multi-joint study found, after inducing a transient traction-VP, the gas bubbles to disappear within 10 minutes . If acute fracture-dislocations present in the emergent setting and the more sensitive CT is ordered, the VP finding may often be overlooked due to the more pressing osseous trauma that requires urgent treatment or be attributed to a concomitant open injury and free air. Second relates to the duration of gas presence in a joint, other than the aforementioned points. In situations of chronic degenerative disease, over time the gas within the joint achieves a new solubility equilibrium and will dissolve back into solution and not be visible. The time to reach equilibrium was not found in any report. The VP is a finding consisting of gas or air bubbles on CT within a joint space. Its finding is under represented in the lower extremity joints with only two citations to date (not including this report). The presence should not be alarming when seen in a non-infectious presentation. Although its finding to date is not correlated with a more advanced joint degeneration to the lower extremity, the finding can be another example of degeneration in addition to visible cartilage loss, subchondral cysts, and scarred joint capsules. This example adds to the literature base of VP to the lower extremity and provides another mode of bringing awareness to physicians who treat the lower extremity. Lee TH, Wapner KL, Mayer DP, Hecht PJ, D M. Computed tomographic demonstration of the vacuum phenomenon in the subtalar and tibiotalar joints. Foot Ankle Int. 1994;15(7):382–5. Gohil I, Vilensky JA, Weber EC. Vacuum phenomenon: clinical relevance. Clin Anat. 2014;27:455–62. Balkissoon ARA. Radiologic interpretation of vacuum phenomena. Crit Rev Diagn Imaging. 1996;37(5):435–60. Ahmad R, Annamalai S, Radford M, Cook C. Vacuum phenomenon in a dislocated joint. Emerg Med J. 2007;24:862. Kloc W, Wasilewski W, Imieliński B, Karwacki Z. Epidural gas aggregation in the course of gaseous degeneration of lumbar intervertebral disk as a cause of foot paresis. Neurol Neurochir Pol. 1998;32(3):699–704. Nagashima T, Minota S. Air bubbles in the knee joint. J Clin Rheumatol. 2016;22(2):94–5. Fairbairn KJ, Mulligan ME, Indication A, Fairbairn KJ, Murphey MD, Resnik S. Gas bubbles in the hip joint on ct: an indication of recent dislocation. Am J Roentgenol. 1995;164(May):931–4. 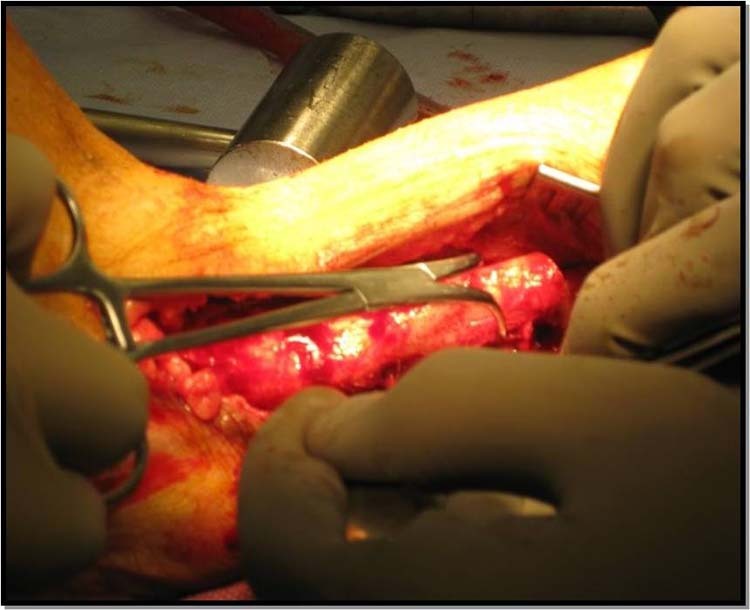 Surgical management of chronic septic arthritis of the ankle joint is a challenging problem. Failure to initiate appropriate antibiotic therapy and perform incision and drainage within the first 24 to 48 hours of onset can result in subchondral bone loss and permanent joint dysfunction. Patients with chronic infection are not only at risk for loss of joint function, but also limb loss. This case report presents a staged procedure for limb salvage of patients with chronic septic arthritis of the ankle joint. 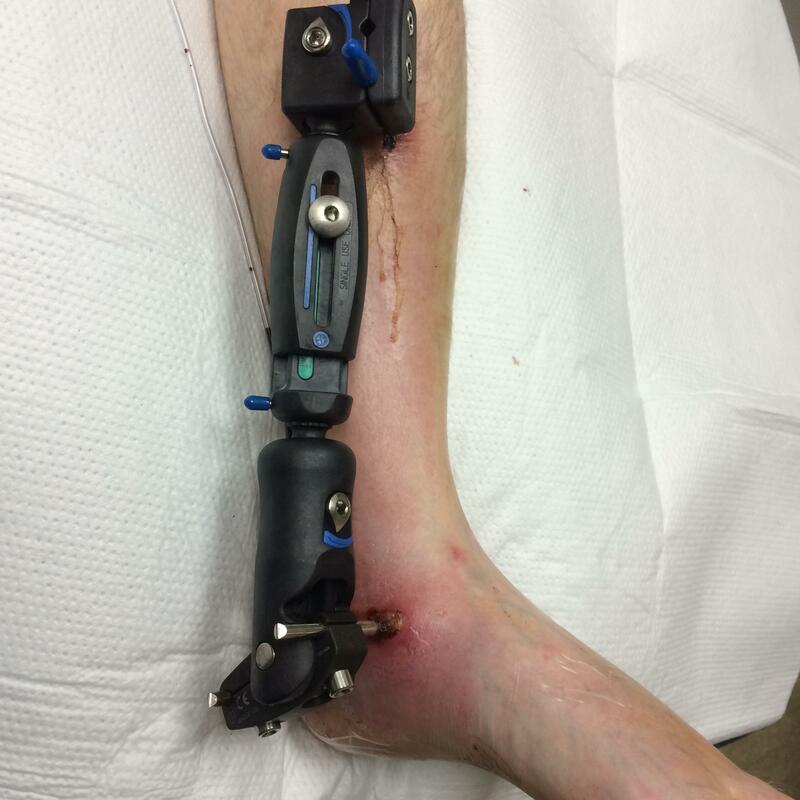 Our technique includes use of both internal and external fixation, along with infection control and autologous pillar grafts. Though our case study is limited, the results are comparable to previous studies. This approach appears to be reasonable for limb salvage in end-stage degenerative joint disease following septic ankle arthritis. Surgical management of chronic septic arthritis of the ankle joint is a challenging problem. Failure to initiate appropriate antibiotic therapy and perform incision and drainage within the first 24 to 48 hours of onset can result in subchondral bone loss and permanent joint dysfunction. Joint function after Staphylococcus aureus (S. aureus) septic arthritis is generally lost 25-50% of the time [1-4]. The mortality rate for septic arthritis has been reported as high as of 10-15% [1-2, 5-8]. Internal ankle arthrodesis techniques are reported to have between 88% to 100% primary fusion rates in patients with aseptic arthritis [9-12]. 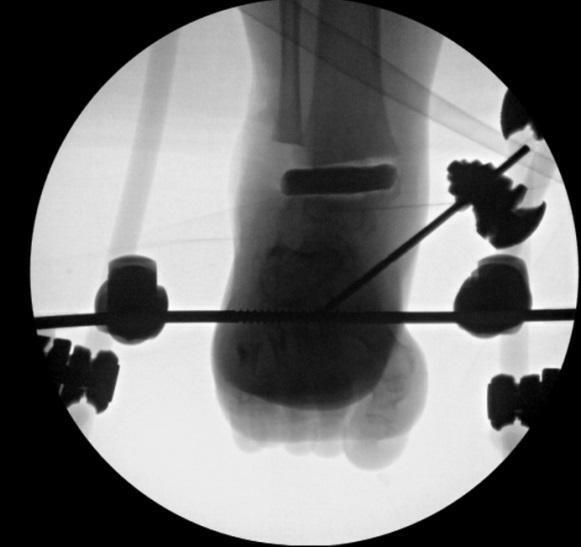 However the fusion rate for ankle arthrodesis in the setting of sepsis is roughly 71% to 93% [13-19]. Surgical management of septic arthritis requires debridement of all non-viable infected soft tissue and bone in order to eradicate infection [14-15, 20]. In addition to debridement, the use of local antibiotic delivery through polymethylmethacrylate (PMMA) has been shown to be an effective adjunct in treating infection [21-24]. Bactericidal levels of antibiotics from PMMA spacers are achieved through the process of elution where high concentrations of antibiotic are released locally, with minimal systemic effect, and limited risk to the patient. Peak antibiotic concentrations are mostly reached within the first week after placement; however, some studies have shown antibiotics may still be released at effective concentrations even after 4-6 weeks of implantation [25-30]. The use of long term intravenous (IV) or suppressive oral antibiotic therapy in conjunction with debridement is an important part of treatment. A 2-6 week course of IV antibiotic therapy is recommended depending on the severity of the infection and host immunity [14, 15, 20, 31]. Fixation techniques for arthrodesis of the diseased ankle secondary to septic arthritis have been controversial. External fixation has been shown to provide adequate torsional stability, but is less effective in maintaining sagittal plane stability. On the other hand, internal fixation has been shown to provide excellent sagittal plane stability, but limited torsional stability. Some authors believe a combination of both fixation techniques lead to optimal outcomes [12, 14, 15, 19, 20]. A concern with arthrodesis is following septic arthritis is loss of limb length. Cancellous bone graft has been shown to be effective in aiding with small defects [15, 20, 31]. Free vascularized bone graft has also been shown to be effective with large bony defects [14, 15, 20]. Use of allograft or synthetic bone grafts have rarely been mentioned in the literature . One technique which has been described in aseptic ankle joint arthrodesis is the use of fibular pillar grafts as structural grafts to maintain length . Patients with chronic infection are not only at risk for loss of joint function, but also limb loss. Cierny et al. related a 25% amputation rate for patients with arthrodesis of septic ankle joints . This case report presents a staged procedure for limb salvage of patients with chronic septic arthritis of the ankle joint. 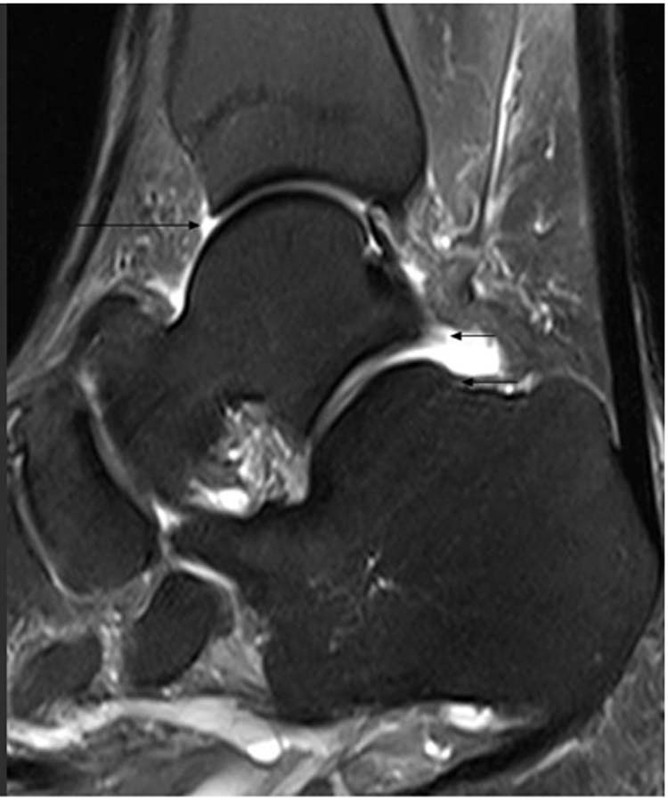 A 54-year-old female with chronic right septic ankle arthritis for 6 months presented for evaluation. The patient had undergone arthrocentesis with corticosteroid, I&D with washout and long-term IV antibiotic therapy. She was offered a below knee amputation elsewhere but was reluctant to proceed and sought a second opinion. Her pre-operative radiographs can be seen in Figure 1 A-C and pre-operative MRI may be seen in Figure 2 A-B. 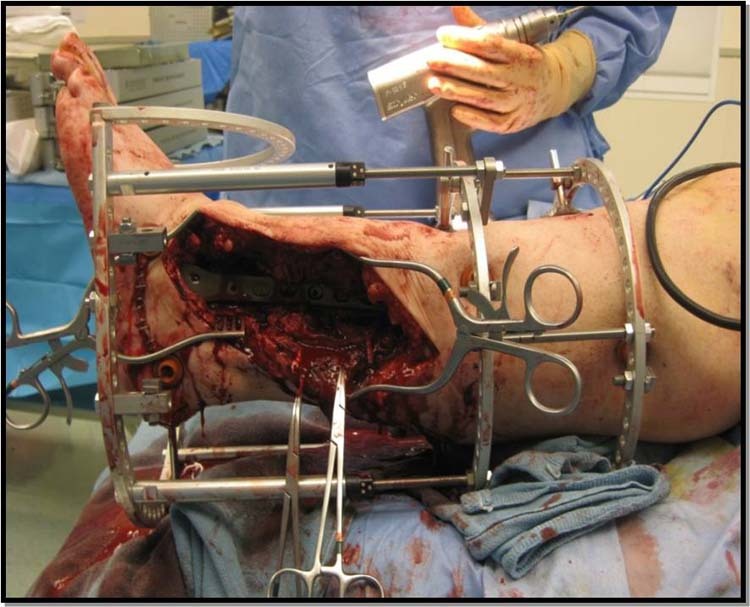 The patient chose to proceed with staged surgical approach for limb salvage. Figure 1 Pre-operative radiographs; Mortise view, AP view, and Lateral view. Figure 2 Pre-operative MRI; T1 Sagittal view, T2 Sagittal view. The patient underwent needle biopsy of the tibia and talus with arthroscopic debridement. Arthroscopy was performed in standard fashion using a 2.7mm 30-degree arthroscope, utilizing a burr and shaver for ankle joint debridement. Arthroscopic evaluation of the ankle joint revealed destruction of both tibial and talar articular surfaces. Cartilage of both articular surfaces was degraded and granular in nature. Cultures recovered S. aureus infection of the tibia. 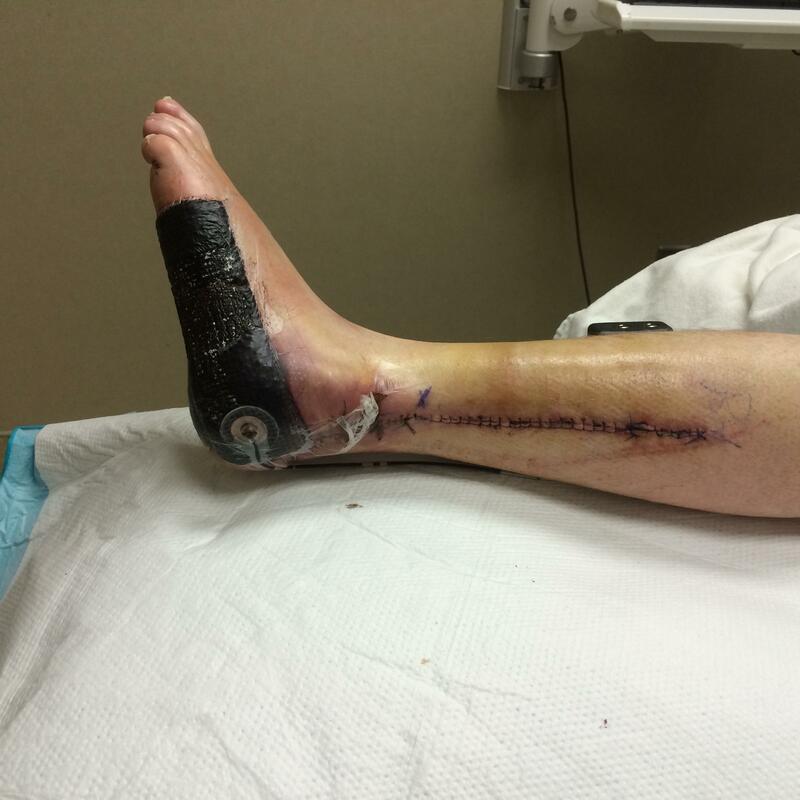 Thirteen days later, open arthrotomy of the ankle joint with extensive debridement of the tibia and talus, as well as insertion of a Vancomycin cement spacer was performed. The arthrotomy was performed using a lateral approach with a fibular osteotomy. The fibula was sent for pathology evaluation and culture, which were shown to be free of any bacterial infection. Debridement was performed through osteotomies of both the tibia and talus which included the articular cartilage and subchondral plate (Figure 3). The joint was then pulse lavaged with 3L of normal saline-bacitracin mixture and a Vancomycin PMMA spacer was placed within the current ankle joint (Figure 4). This was then stabilized with a monolateral external fixator. The patient was placed on 6 weeks of antibiotic therapy by Infectious Disease including IV Cephazolin and PO Rifampin. 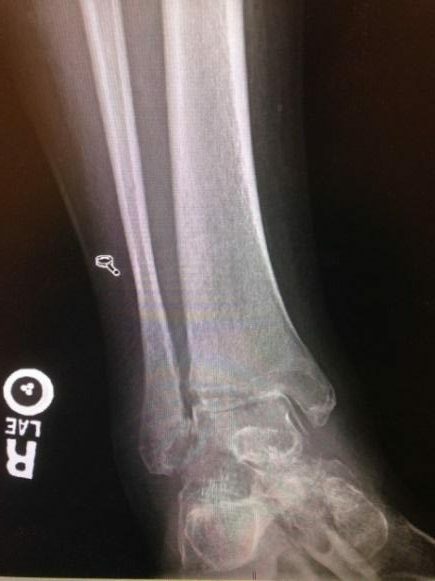 Figure 3 Intra-op radiograph status post fibula take down and wide excisional debridement of tibia and talus. Figure 4 Intra-op radiographs and picture of Vancomycin PMMA spacer. 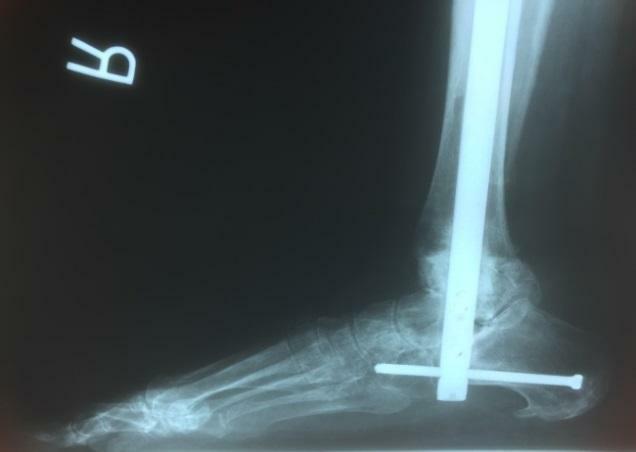 Ten weeks later, the patient underwent intramedullary (IM) nail tibiotalocalcaneal arthrodesis (TTC) (Figure 5). 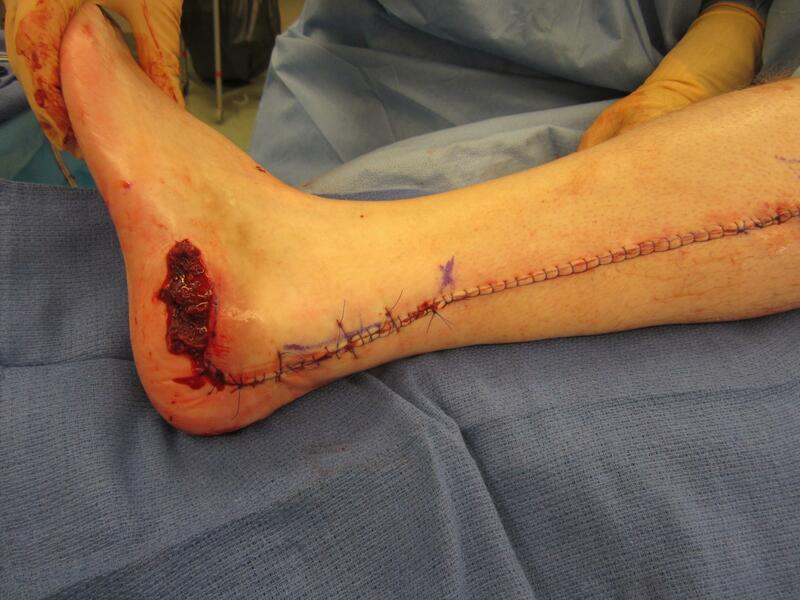 The original lateral incision was utilized to access the ankle joint. 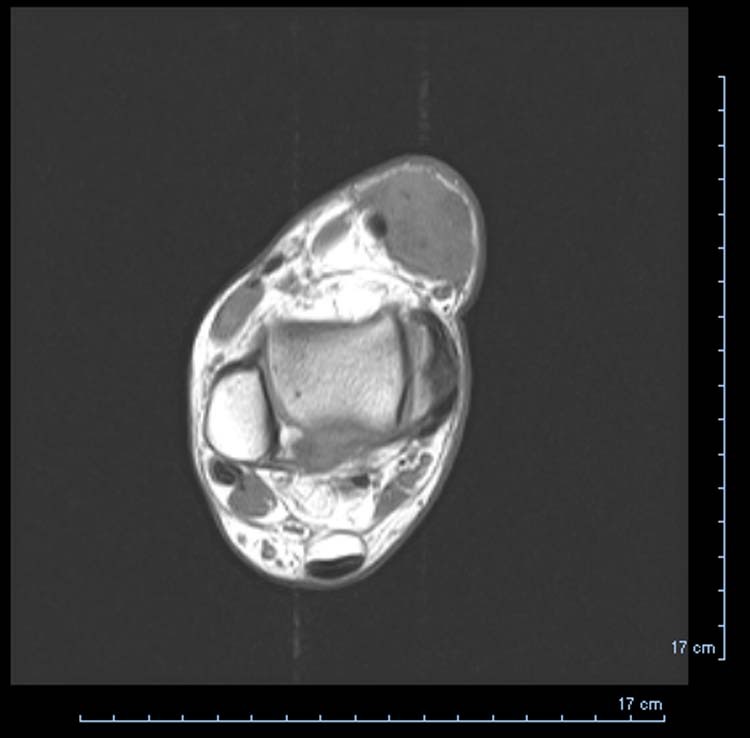 The Vancomycin spacer was removed and soft-tissue specimens from the tibia and talus, which were sent for frozen section evaluation by pathology, were negative for infection. 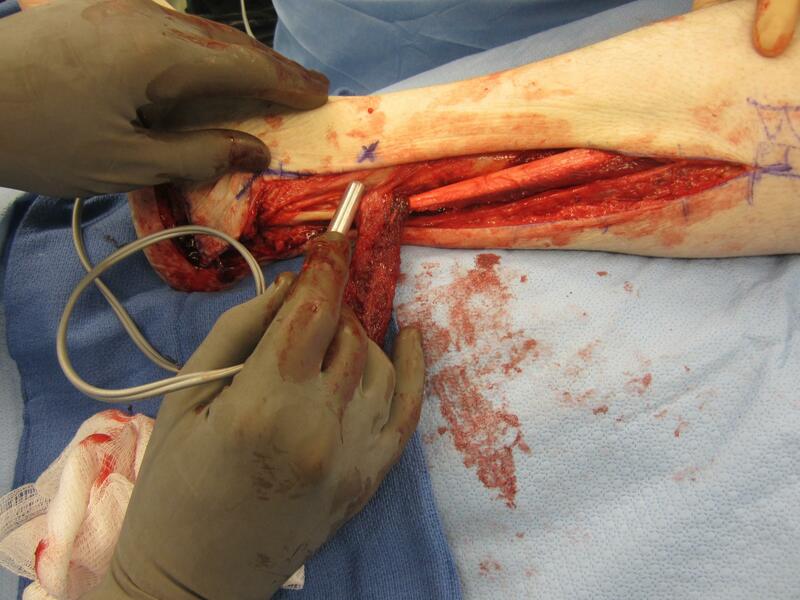 The bony surfaces were then prepared for arthrodesis in standard fashion using curettes, osteotomes, and drills. The subtalar joint was prepared in a similar fashion. The ankle was grafted with morselized femoral head combined with bone morphogenic proteins to provide osteoconduction and osteoinduction, as well as fibular pillar grafts to provide structural support and maintain length. Fixation was accomplished with an IM nail. The patient remained non-weight bearing for 3 months. She was then transitioned into a fracture boot for an additional month and then into a sneaker. No major or minor complications were noted throughout her recovery process. The patient has continued to improve throughout the post-operative course and is able to bear weight without assistance in standard foot gear. Serial radiographs have demonstrated complete union of all involved joints (Figure 6). Figure 5 Intra-op radiographs (axial view, AP view, and lateral view) of IM nail with fibular pillar grafts. Figure 6 Final radiographs showing consolidation (AP ankle, oblique ankle, lateral view) of IM nail with fibular pillar grafts. The fusion rate within the literature varies dramatically. Hawkins showed a variation between 71-94% depending on the control of infection within the joint . Richter also reported a fusion rate of 86.6% for septic ankles . Cierny et al reported results of 83% to 100%. Cierny believed this was secondary to the quality of the surrounding soft tissues. These cases used either external, or hybrid fixation techniques for their fusion . Treatment of S. aureus septic ankle arthritis should include immediate lavage and debridement of the joint with culture and sensitivity driven antibiotic therapy [14, 15, 20]. However, this treatment alone leaves the patient predisposed to continued pain and discomfort secondary to sequela of septic arthritis. Therefore, ankle arthrodesis should be considered as a long-term option following resolution of the infection . External fixation or a hybrid of external and internal fixation has been recommended for arthrodesis following septic ankle arthritis. We used a solitary IM nail for fixation in our cases. Klouche et al. discussed the use of internal fixation in a one-stage procedure using two cross screws through a lateral approach. There technique provided a cure rate of 85% and a consolidation rate of 89.5% at 4.8 months. Empiric antibiotics were administered to all patients and were modified based on culture and sensitivity results obtained at the time of surgery. No local antibiotics were used with their technique . We used IV antibiotics before and after our definitive procedure, as well as, a Vancomycin loaded cement spacer following debridement of the infected bone. Though our case study is limited, the results have been comparable to previous studies. This approach appears to be reasonable for limb salvage in end-stage degenerative joint disease following septic ankle arthritis. An evidence based study with increased numbers of patients and long term follow up would be beneficial in further accessing this technique for the treatment of septic arthritis of the ankle. Cooper C, Cawley MID. Bacterial arthritis in an English health district: a 10 year review. Ann Rheum Dis. 1986; 45:458-463. Peters RHJ, Rasker JJ, Jacobs JWG, Prevo RL, Karthaus RP. Bacterial arthritis in a district hospital. Clin Rheumatol. 1992; 11:351-355. Youssef PP, York JR. Septic arthritis: a second decade of experience. Aust N Z J Med. 1994; 24:307-311. Kaandorp CJE, Krunen P, Bernelot Moens HJ, Habbema JDF, Van Schaardenburg D. The outcome of bacterial arthritis: A prospective community-based study. Arthritis Rheum. 1997; 40(5):884-92. Meijers KAE, Dijkmans BAC, Hermans J, van den Broek PJ, Cats A. Non-gonococcal infectious arthritis: a retrospective study. J Infect. 1987; 14:13-20. Yu LP, Bradley JD, Hugenberg ST, Brandt KD. Predictors of mortality in non-postoperative patients with septic arthritis. Scand J Rheumatol. 1992; 21:142-144. Mathews C. J., Weston V. C., Jones A., Field M., Coakley G. Bacterial septic arthritis in adults. The Lancet.2010; 375(9717):846-855. Miller A, Abduljabbar F, Jarzem P. Polyarticular Septic Arthritis in an Immunocompetent Adult: A Case Report and Review of the Literature. Case Rep Orthop. 2015; 2015:602137. Scranton PE Jr. Use of internal compression in arthrodesis of the ankle. J Bone Joint Surg Am. 1985; 67:550–555. Mann RA, Rongstad KM. Arthrodesis of the ankle: a critical analysis. Foot Ankle Int. 1998; 19:3–9. 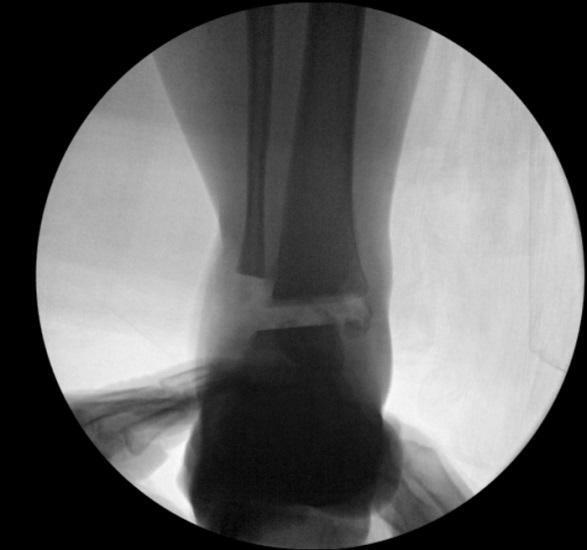 Zwipp H, Grass R, Rammelt S, Dahlen C. Arthrodesis: non-union of the ankle—arthrodesis failed. Chirurg. 1999; 70:1216–1224. Kollig E, Esenwein SA, Muhr G, Kutscha-Lissberg F. Fusion of the septic ankle: experience with 15 cases using hybrid external fixation. J Trauma. 2003 Oct;55(4):685-91. Hawkins BJ, Langerman RJ, Anger DM, Calhoun JH. 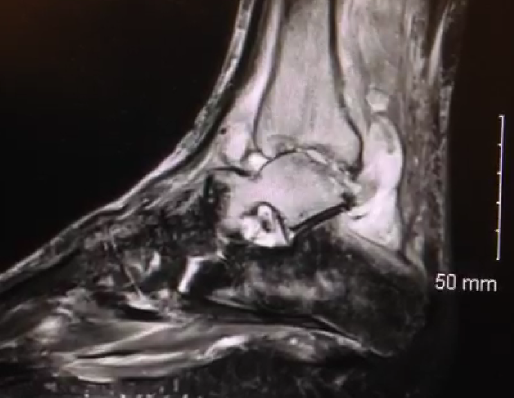 The Ilizarov technique in ankle fusion. Clin Orthop. 1994; 303:217–225. Richter D, Hahn MP, Laun RA, Ekkernkamp A, Muhr G, Ostermann PA. Arthrodesis of the infected ankle and subtalar joint: technique, indications, and results of 45 consecutive cases. J Trauma. 1999; 47:1072–1078. Cierny G III, Cook WG, Mader JT. 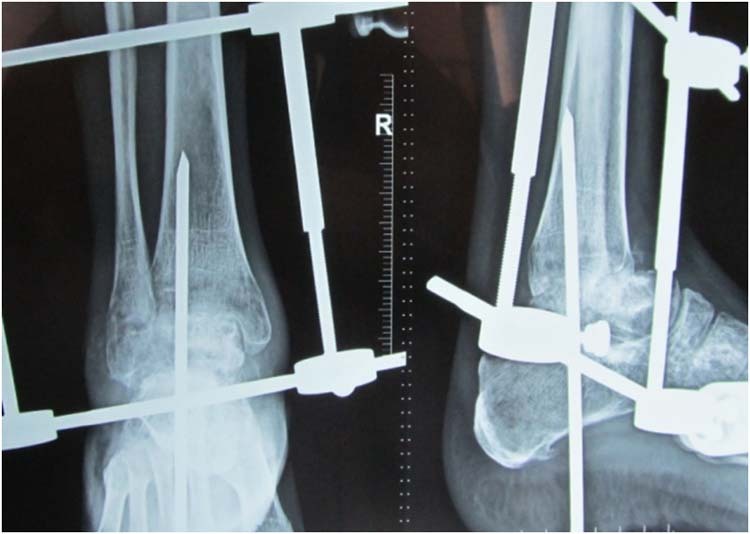 Ankle arthrodesis in the presence of ongoing sepsis: indications, methods, and results. Orthop Clin North Am. 1989;20:709–721. Johnson EE, Weltmer J, Lian GJ, Cracchiolo A III. Ilizarov ankle arthrodesis. Clin Orthop. 1992; 280:160–169. Lonner JH, Koval KJ, Golyakhovsky V, Frankel VH. Posttraumatic nonunion of the distal tibial metaphysis: treatment using the Ilizarov circular external fixator. Am J Orthop. 1995; suppl: 16–21. Stasikelis PJ, Calhoun JH, Ledbetter BR, Anger DM, Mader JT. Treatment of infected pilon nonunions with small pin fixators. Foot Ankle. 1993; 14:373–379. 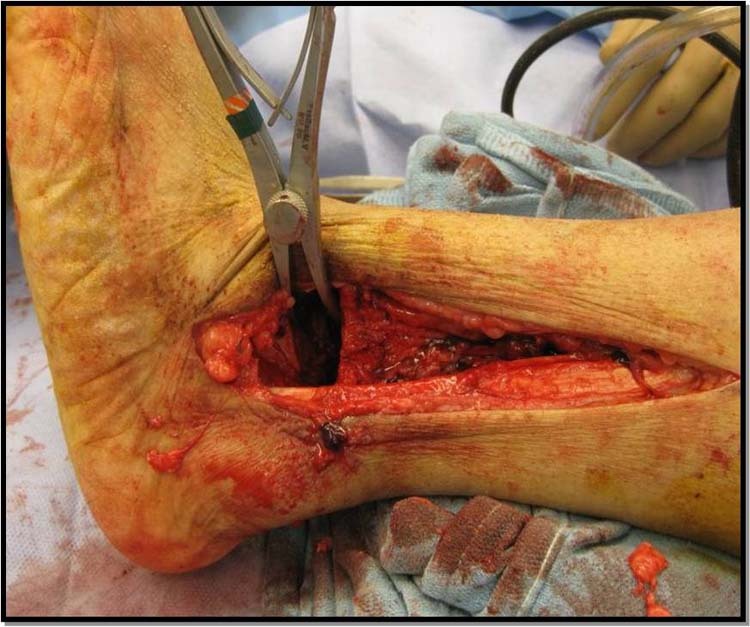 Thordarson DB, Patzakis MJ, Holtom P, Sherman R. Salvage of the septic ankle with concomitant tibial osteomyelitis. Foot Ankle Int. 1997; 18:151–156. Cierny G, Zorn EZ. Arthrodesis of the tibiotalar joint for sepsis. Foot Ankle Clin 1996; 1:177– 97. Chen NT, Hong HZ, Hooper DC, May JW. The effect of systemic antibiotic and antibiotic impregnated polymethylmethacrylate beads on the bacterial clearance in wounds containing contaminated dead bone. Plastic Reconst Surg 1993; 97(2):1305–11. Donati D, Biscaglia R. The use of antibiotic impregnated cement in infected reconstructions after resection for bone tumours. J Bone Joint Surg Br 1998; 80(6):1045– 50. Popham GJ, Mangino P, Seligson D, et al. Antibiotic impregnated beads: Part II: factors in antibiotic selection. Orthop Rev 1991; 20:331–7. Ostermann PA, Henry SL, Seligson D. The role of local antibiotic therapy in the management of compound fractures. Corr 1993; 295:102– 11. Antrum RM, Solomkin JS. A review of antibiotic prophylaxis for open fractures. Orthop Rev 1987; 16:81–9. 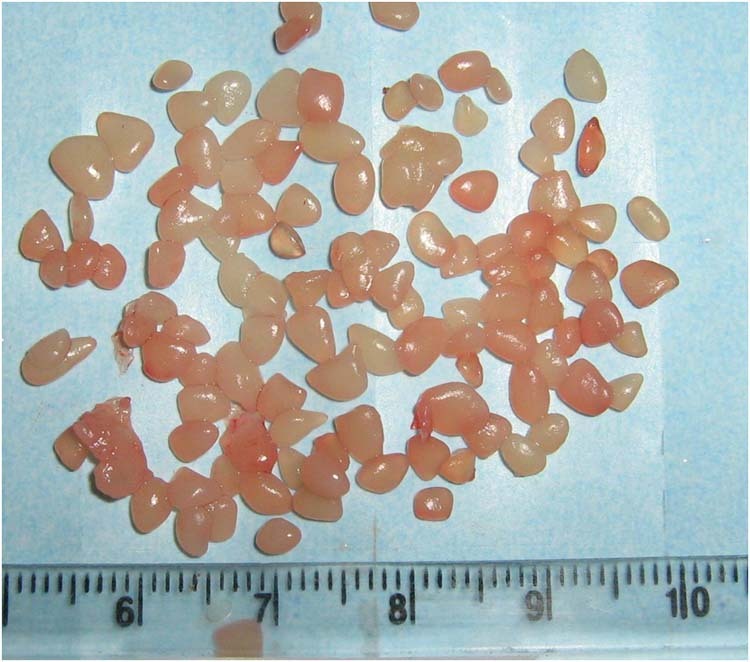 Eckman JB Jr, Henry SL, Manginio PD, Seligson D. Wound and serum levels of tobramycin with the prophylactic use of tobramycin-impregnated polymethylmethacrylate beads in compound fractures. Clin Orthop 1988; 237:213–5. Lerner RK, Esterhai JL, Polomono RC, et al. Psychological, functional, and quality of life assessment of patients with posttraumatic fracture nonunion, chronic refractory osteomyelitis, and lower extremity amputation. Arch Phys Rehab 1991; 72:122–6. Patzakis MJ, Harvey JP Jr, Ivler D. The role of antibiotics in the management of open fractures. J Bone Joint Surg Am 1974; 56:532– 41. Schentag JJ, Lasezkay G, Plant ME, et al. Comparative tissue accumulation of gentamycin and tobramycin in patients. J Antimicrob Chemother 1979; 4(SupplA):23–30. Seligson D, Popham GJ, Voos K, Henry SL, Faghri M. Antibiotic-leaching from polymethylmethacrylate beads. J Bone Joint Surg Am 1993; 75:714– 20. Stuart MJ, Morrey BF. Arthrodesis of the diabetic neuropathic ankle joint. Clin Orthop 1990; 253:209– 11. Esterhai JL Jr, Sennett B, Gelb H, et al. Treatment of chronic osteomyelitis complicating nonunion and segmental defects of the tibia with open cancellous bone graft, posterolateral bone graft, and soft tissue transfer. Trauma 1990; 30:49–54. 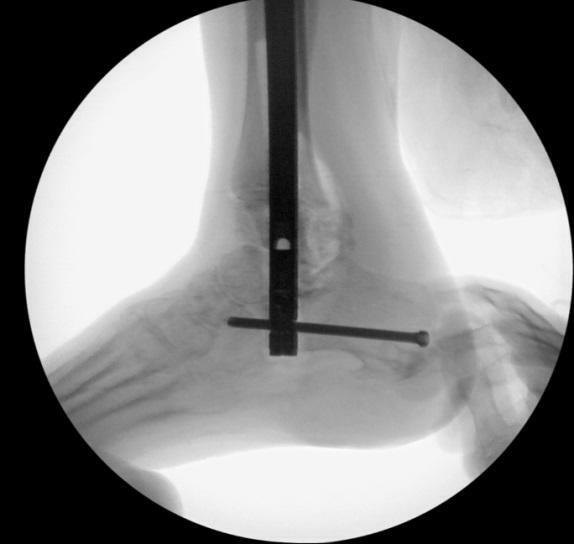 Paul J, Barg A, Horisberger M, Herrera M, Henninger HB, Valderrabano V. Ankle salvage surgery with autologous circular pillar fibula augmentation and intramedullary hindfoot nail. J Foot Ankle Surg. 2014 Sep-Oct; 53(5):601-5. Klouche S, El-Masri F, Graff W, Mamoudy P. Arthrodesis with internal fixation of the infected ankle. J Foot Ankle Surg. 2011 Jan-Feb; 50(1):25-30. Soft tissue defects of the distal leg and hindfoot are difficult to eradicate. Avascular structures become exposed through seemingly superficial wounds rather quickly. The present case describes a surgical technique for the peroneus brevis muscle flap for coverage of a postoperative lateral heel wound following a lateral extensile approach for ORIF of a calcaneal fracture. Nonoperative and operative wound care modalities failed over the course of several years, and a peroneus brevis rotational flap was attempted for wound coverage. Although several minor complications occurred, the wound had successful epithelialization at 3 months. The distally pedicled peroneus brevis muscle flap offers a good option at wound coverage in difficult to heal wounds of the distal leg and hindfoot. 3 – Director, Franciscan Foot and Ankle Institute; Medical Director, Foot & Ankle Service, CHI Franciscan Health, Federal Way, WA. Soft tissue defects of the foot and ankle present a significant challenge. There is little soft tissue coverage and exposed tendon and bone can easily occur following elective reconstruction or trauma, requiring surgery. 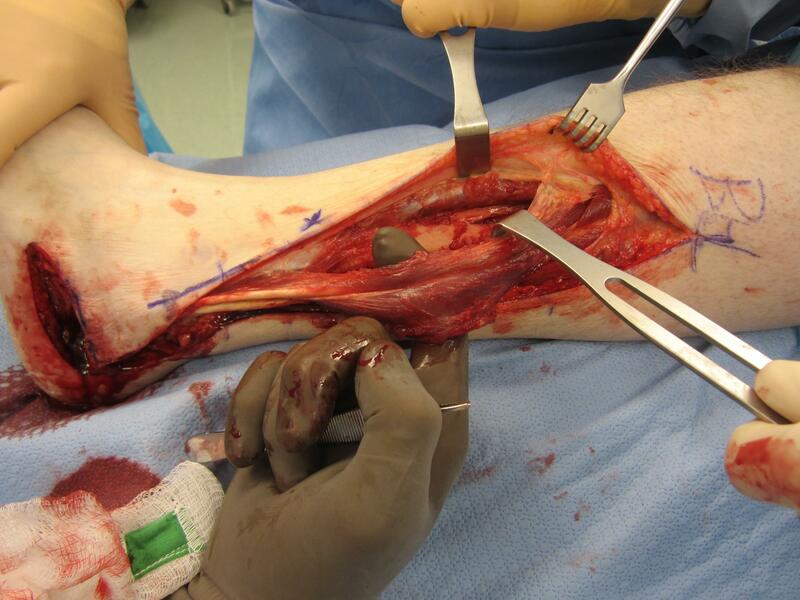 Skin grafting is often not an option in this region as bone and tendon are not suitable as a recipient bed. Rotational muscle flap techniques for foot and ankle wound closure are gaining popularity and have proven effective. 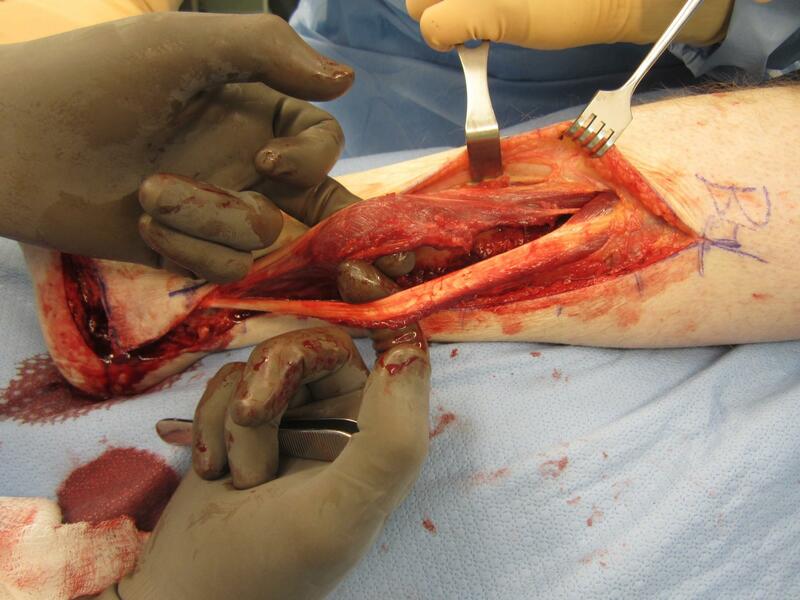 Muscle flaps offer pliability and can eradicate dead space, can overcome residual bacterial infection in bone, improve blood flow, and will provide a vascular recipient bed for split thickness skin grafting . 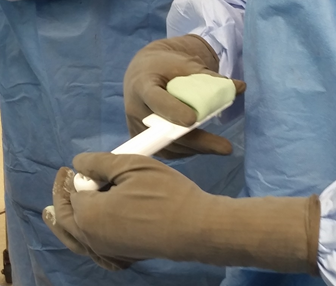 While negative pressure wound therapy devices are excellent at promoting expedited closure of deep wounds, they should not be placed directly over bone or tendon and especially not in the setting of residual infected tissue. Indications for rotational muscle flap wound closure may include exposed bone with osteomyelitis, traumatic wounds, non-healing wounds over the lateral ankle and hindfoot after Achilles tendon procedures, surgical wound dehiscence recalcitrant to nonoperative therapies after calcaneal fractures, ankle fractures, and total ankle arthroplasty. In a systematic review, Yu et al, demonstrated a wound complication rate of 13.5% in calcaneal fractures after ORIF . There has been a movement toward minimally invasive techniques, but the lateral extensile incision is still routinely utilized. 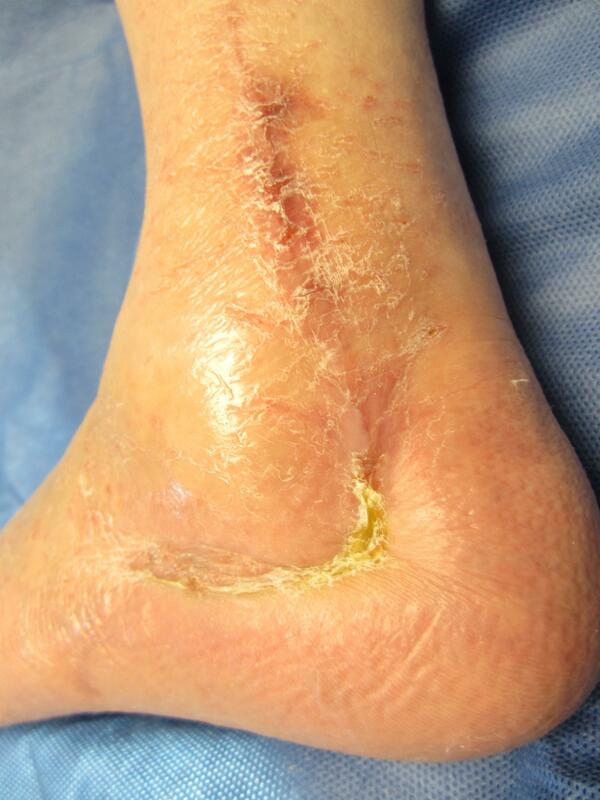 Raikin et al demonstrated an 8.5% incidence of wound complications following TAR with anterior midline incisional approach that required at least one secondary visit for surgical wound debridement . Wound dehiscence after TAR requires immediate definitive treatment to avoid catastrophic deep space infection. The distally pedicled peroneus brevis muscle flap offers a relatively simple, reproducible and reliable option for wound closure with complication rate equal or reduced compared to other techniques. In general the muscle flap should not be used as a first line procedure, but is used in limb salvage situations and has very little downside. The peroneus brevis muscle flap also has the advantage of low donor site morbidity and heals with minimal scar. Lower extremity surgeons can easily perform the peroneus brevis flap closure if it is acceptable in the foot and ankle specialist’s region to perform this type of procedure. Attinger described the role of various intrinsic muscle flaps for small wound closure of the foot and reported a 96% success rate . The abductor hallucis muscle flap has been reported to provide excellent outcomes in plantar heel defects [4,5]. While intrinsic flaps have proven efficacy for small wounds about the foot, they are not sufficient for larger wounds of the hindfoot, ankle and lower leg. Larger wounds in the distal third of the leg and hindfoot are amenable to the peroneus brevis flap. The peroneus brevis muscle is classified as a type IV muscle flap by Mathes and Nahai, which represents a muscle flap with segmental blood supply provided by branches of equal importance (Table 1) . Ensat et al evaluated the blood supply of the peroneus brevis muscle flap identifying constant blood supply by segmental branches of the peroneal and tibial arteries and also supported Yang’s finding of the most distal pedicle being provided between 4-5 centimeters proximal to the tip of the fibula [7,8]. Ensat also recommended a pivot point at least 6-cm above the tip of the fibula to assure there is an intact vascular pedicle, however, this should always be evaluated intraoperatively . The muscle length available for rotation is close to 20-cm, but due to distal flap necrosis, the most proximal 2-cm should always be removed, providing a muscle approximately 18-cm in length [9,10,11]. The arc of rotation is determined by the most distal vascular pedicle, which should allow an average of 12-cm from the pivot point. We present a case in which a chronic lateral heel wound following ORIF of calcaneus was treated successfully with a distally pedicled peroneus brevis flap. Our scenario is similar to Rodriguez who recently reported success of the peroneus brevis flap following wound dehiscence after ORIF of a lateral malleolar fracture with subsequent surgical wound dehiscence . 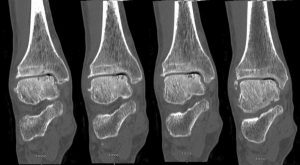 In this case report, a 63 year old male non-smoker sustained a closed intra-articular calcaneal fracture. The records from previous surgeons were not retrieved so the exact timeline is unknown but the following events occurred over the course of several years prior to his definitive operation and closure. The patient had an ORIF through a lateral extensile approach with dehiscence at the apex of the incision which never fully healed. He had hardware removal and local wound care which failed. He then had a small rotational flap which failed, followed by an advancement flap which resulted in re-opening of the sinus tract and a chronically draining wound with exposed bone. He presented to a local plastic surgeon for consultation who felt a free flap was not a good option. He then presented to the author’s clinic for a preoperative evaluation. On arrival to clinic the patient had a small wound at the apex with a sinus tract and suspected osteomyelitis of the lateral calcaneal wall, which was draining minor amounts of serous fluid (Figure 1). A distally pedicled peroneus brevis rotational flap was planned. 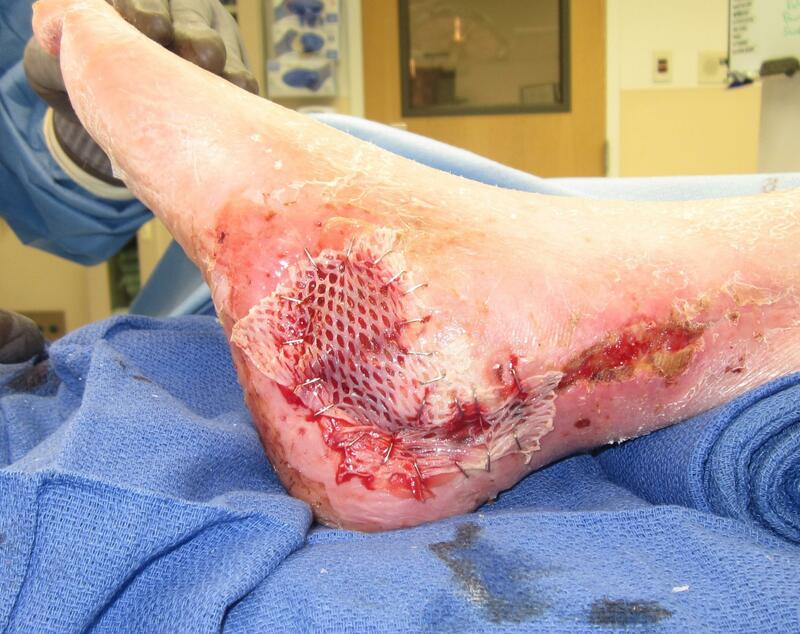 Figure 1 Chronic lateral hindfoot wound recalcitrant to several operative debridements, antibiotics, local wound care, and local skin flaps. 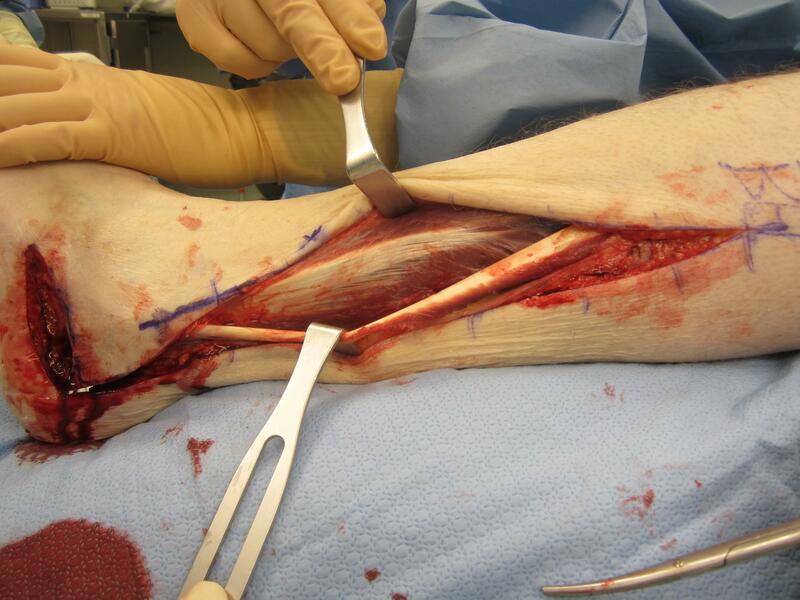 Figure 2 Lateral incision over the fibula, with the peroneus longus retracted inferiorly and the peroneus brevis muscle belly and tendon origin exposed. After skin preparation, and exsanguination of the limb, a pneumatic thigh tourniquet was inflated to 350mmHg. 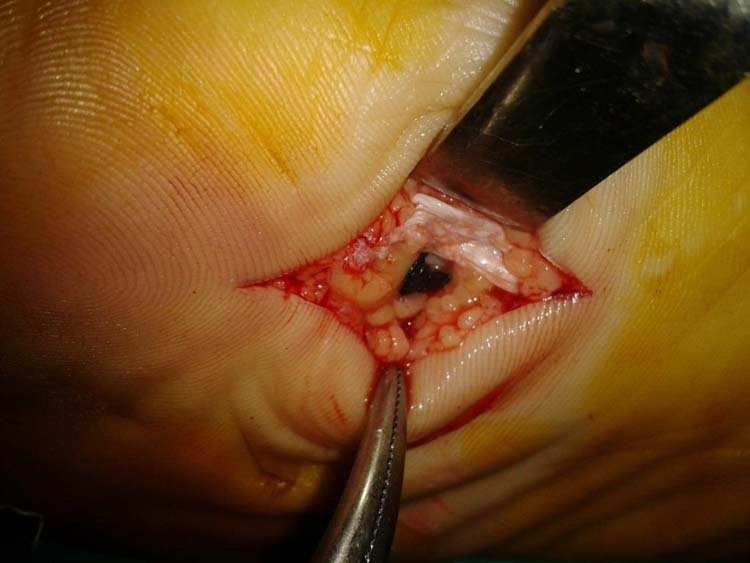 An incision was made overlying the lateral heel wound in a curvilinear fashion extending a few centimeters proximally and a few distal to the wound. The scar tissue was bluntly dissected through down to calcaneus, and the skin was elevated in a single layer as a flap. There was a loose portion of cement that was noted in the lateral wall of the calcaneus which had been left from a prior surgery and this was removed. Figure 3 Peroneus longus in the right hand, and peroneus brevis muscle belly held in the left. Figure 4 Peroneus brevis muscle belly being elevated off the fibula, moving proximally. The calcaneus was debrided to good, healthy bleeding bone that appeared without signs of infection. Attention was then directed to the lateral leg where a standard incision was made as described by Eren . The incision connected with the lateral heel wound incision. The crural fascia overlying the peroneals was incised (Figure 2). The peroneus brevis was followed up its muscle belly proximally until the origin was released (Figure 3,4,5). Segmental pedicles were ligated from proximal to distal until approximately 6-cm proximal to the lateral malleolus. Figure 5 The free peroneus brevis flap, with distal vascular pedicles still in tact. Figure 6 Intraoperative doppler to assure the pedicle is patent to provide blood supply to the brevis muscle. Figure 7 The peroneus brevis muscle flap rotated down, showing adequate length to reach the lateral heel wound. Figure 8 Closure of the harvest site, demonstrating easy closure of the harvest site. 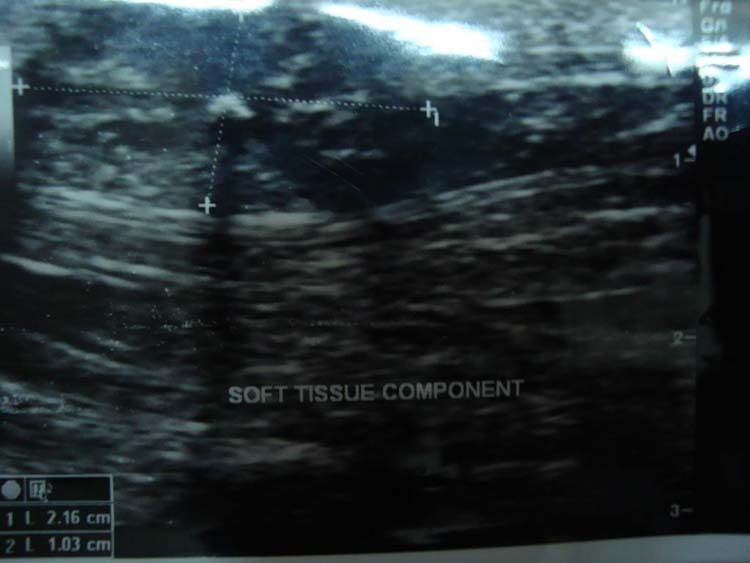 Utilizing ultrasound, a vascular pedicle was identified at this level (Figure 6). Care was taken to not violate the pedicle. The peroneus brevis was folded from proximal to distal into the wound and overlying the exposed calcaneal wound (Figure 7). It was loosely secured in place overlying the lateral wall of the calcaneus. The wound was then closed in layers proximally, leaving the distal wound overlying the lateral wall of the calcaneus open with the muscle flap secured within the wound (Figures 8,9). An Integra bilayer wound matrix was then placed and trimmed to the appropriate size overlying the muscle flap (Figure 10). It was secured in place around the rim of the wound utilizing staples with a single staple in the middle of the flap. The membrane was then fenestrated to allow drainage. The site was then dressed with negative pressure wound therapy (Figure 11). 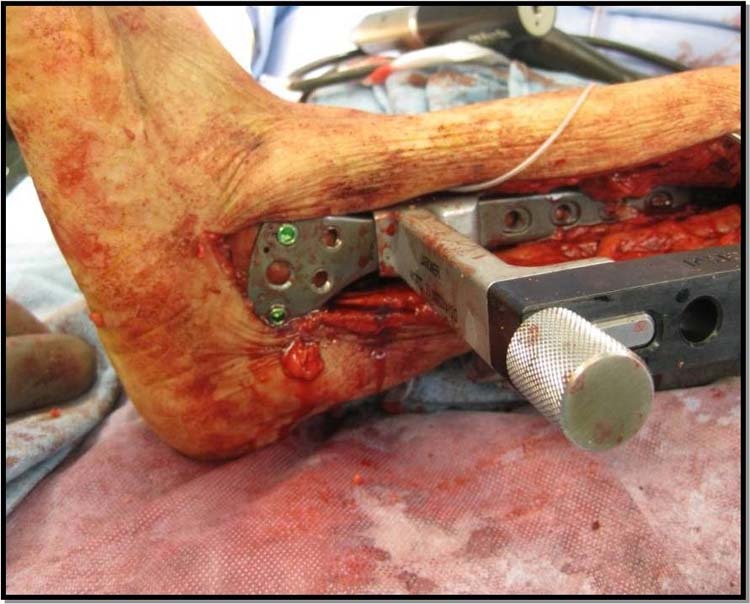 A monorail external fixator was applied to the medial calcaneus and medial tibia with half pins to establish stability while being able to access the wound for local wound assessment and care in the early wound healing phase (Figure 12). Proper alignment was confirmed under fluoroscopy. Sterile dressings were then applied. Tourniquet was deflated. Figure 9 Closure of the incision along the lateral leg down to the original defect site. The original defect site should be left open, and ideally is covered with a biologic dressing. Figure 10 Securing an Integra graft over the exposed peroneus brevis in the chronic wound site with staples. Figure 11 Wound vac secured over the Integra graft after fenestrating the integra graft. 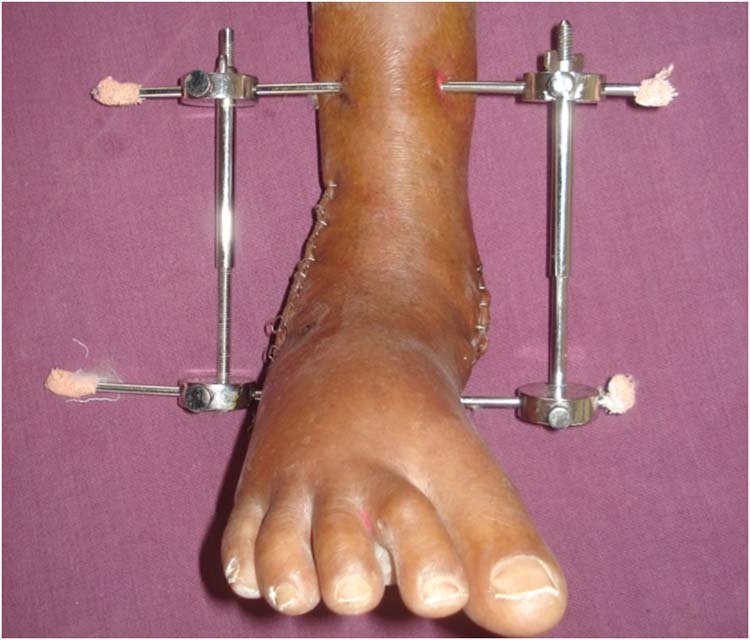 Figure 12 Unilateral External fixator applied to the medial tibia for stabilization of the muscle and the wound to allow for incorporation. 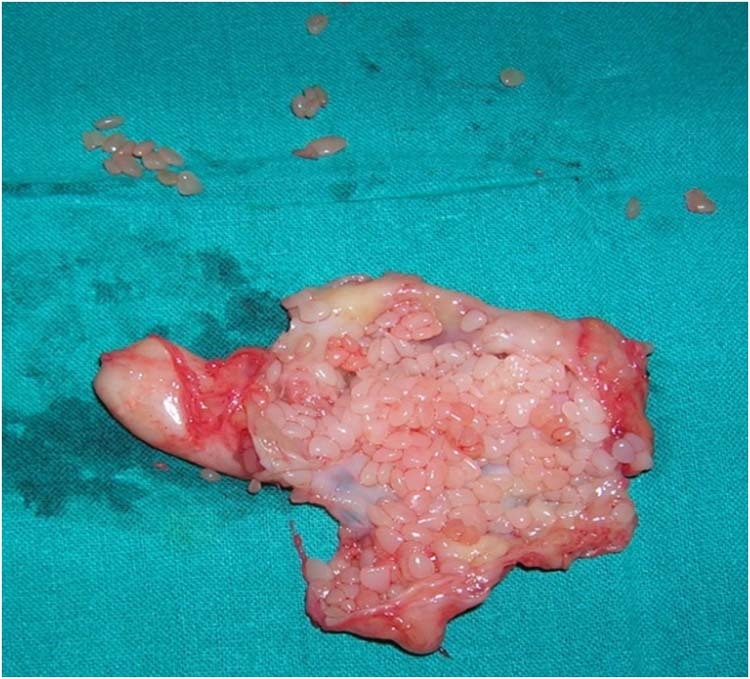 Figure 13 Application of STSG roughly 3 weeks after the Integra graft was placed. The silicone layer was removed and the wound was carefully debrided and cleansed prior to application. STSG secured with staples. Figure 14 Healed lateral foot wound. About 2 weeks later, he presented to the emergency department with fever and chills and was noted to have a pin tract infection, requiring removal of one of the pins in the ED. The following week he returned to the operating room for removal of the external fixator and debridement of a small portion of muscle flap necrosis. Following debridement, the split-thickness skin graft (STSG) was secured with staples and negative pressure wound therapy was applied (Figure 13). The patient presented to clinic for follow-up seven days post-skin graft application and negative pressure wound therapy was removed. Four days later he returned to clinic and reported a visit to the ED for fever and previous talar pin site irritation and pain with two centimeter diameter of surrounding erythema. He was started on IV rocephin for a few days and then transitioned to a two week course of Keflex. He had resolution of infection. His donor site incision healed without incident. He was discharged with instructions to remain NWB to his surgical limb until complete incorporation of graft, about two months. At final three-month follow-up he had completely healed (Figure 14). There are several key points to discuss regarding this case report. First, there was partial flap necrosis, which required repeat debridement in the OR. For the case presented, the most proximal aspect of the peroneus brevis muscle belly was not debrided, which has been recommended by multiple authors [9,10,11]. Other potential ways to improve wound closure may include the use of bilayer membrane which, after it takes, will provide a superior surface for a STSG. Negative pressure wound therapy can be applied at 50-125mmHg . It has been proposed that higher vacuum settings may be damaging to skin grafts, but this theory was not upheld . Recently it was found that wound vac application at 75mmHg applied for seven days post-operatively significantly reduced partial flap necrosis and skin graft necrosis, and they concluded that prolonging the period of wound vac application may further reduce complications by eliminating shear force, improving neovascularization of the muscle, and reducing edema and venous congestion . There is debate whether to perform the transfer of the brevis through a subcutaneous tunnel or whether to connect the harvesting incision to recipient site. It is not absolutely necessary to connect the incision with the recipient site, but there should not be excessive tension within the subcutaneous tunnel as this may obstruct venous outflow resulting in flap failure. If there is question, one should connect the recipient bed with the donor site incision. A few other obstacles occurred which can be avoided. While pin tract infections are common when using external fixators, rarely catastrophic infection develops. Minor infections can be managed with local wound care and oral antibiotics oftentimes. As long as there is not failure at the bone-pin interface with loosening, fracture with nonunion or malunion, or chronic osteomyelitis, it should not compromise your end result. Placing a unilateral fixator to stabilize the extremity offers several advantages. It offers stability to the extremity and the wound bed in the immediate postoperative phase while also permitting wound care and wound observation for the first few weeks after index surgery. The external fixator can be removed at the three week mark as this is when you can return to the operating room, remove the silicone layer from the bilayer membrane, and harvest and apply the STSG. Other options include applying a posterior splint for immobilization, but this doesn’t offer an easily accessible portal for wound evaluation and wound care and, makes continued care with a wound vac particularly difficult. If the recipient site is prone to shear forces, ie lateral malleolus, be sure to utilize a bulky soft dressing to protect the graft site. Although several publications [14,15] have advocated for single stage procedure, it is prudent to wait for application of the STSG until muscle flap viability is assured. This prevents unnecessary repeat skin grafting. It has been demonstrated that the peroneus brevis muscle flap provides a reliable means for treating bone infections, providing blood supply, and a suitable recipient bed for skin grafting . Preoperatively the patients should be evaluated for vascular insufficiency. As foot and ankle experts, sacrificing the primary evertor of the foot may seem uncouth, but these are limb salvage situations. One can perform a tenodesis of the the peroneus brevis to the longus to enhance eversion power if it is possible. However, it has been shown that eversion and plantarflexion are maintained following the procedure even without ancillary procedures and patients do not report lateral ankle instability . The donor site is rarely problematic, and can be closed primarily without issue [10-12,16-18]. The peroneus brevis has a consistent blood flow [7,16,17]. The maximum number of vascular pedicles should be maintained as possible, but one can elect to ligate all pedicles leaving only the most distal intact approximately 6-cm proximal to the tip of the fibula. To ensure adequate blood supply will be provided by each successive pedicle, a vascular clip can be placed temporarily to ensure the next pedicle maintains adequate perfusion. Ensat et al demonstrated in a cadaveric model that there were an average of 5.1 segmental branches to the muscle. This included branches from both the peroneal and the anterior tibial artery, however, most branches were derived from the peroneal artery . The most distal vascular branch was derived from the peroneal artery in 100% of cadavers at a distance about 4.3cm proximal to the tip of the lateral malleolus. There is also retrograde flow provided from the posterior tibial artery . This is important in gaining a muscle flap with the most potential length. The pivot point should be at least 6-cm proximal to the lateral malleolus to ensure there is a vascular pedicle attached distally to supply the muscle when performing rotational flaps. The diameter of the pedicle must be at least 0.5mm, while the average size pedicle is 1.1mm this is rarely a problem . The average length of the muscle is 19.8cm, but the most proximal 2-cm should be resected as this area of the graft is expected to undergo necrosis. In conclusion, many studies have found reliability in this muscle flap. It offers great utility to cover defects in the distal leg and hindfoot. It can cover defects of the anterior ankle, lateral ankle and hindfoot. Despite some authors reporting an unfavorable success rate, the majority of reports found high rates of success and this should be considered in the reconstructive ladder for complex lower extremity wounds [10,11,18,19]. Mathes SJ, Nahai F. Reconstructive Surgery: Principles, Anatomy, and Technique. New York: Churchill-Livingstone: 1997. 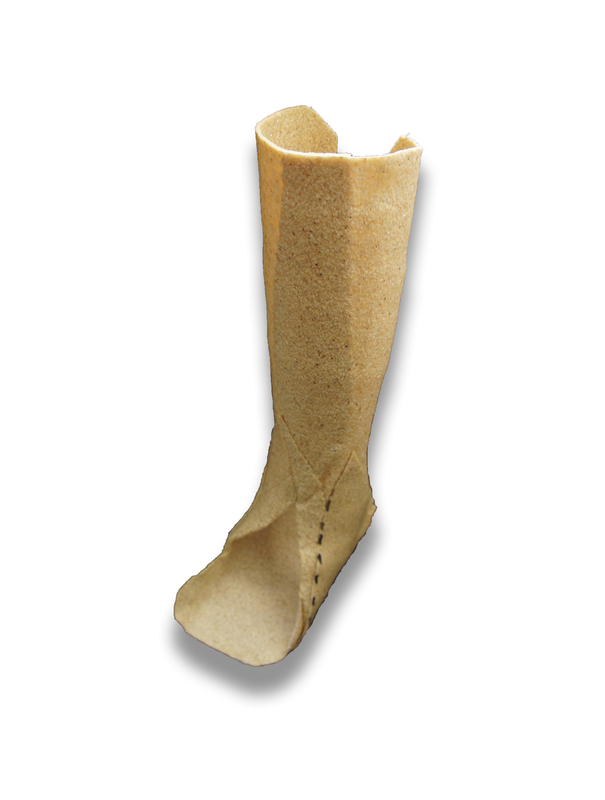 Foot and ankle immobilization is usually based on circular support, either using casts or boot-like orthoses. Basic requirements for immobilization of the ankle region include reliable support and possibility of full weight bearing during healing. Woodcast® is a novel, freely 3D moldable cast material based on non-toxic components. The material is strong but light weight and can be used as a split or a cast. Our hypothesis was to test in a proof-of-concept type study, whether a new open cast design, leaving the calf area free can be clinically used in ankle immobilization. Thirty patients with an acute ankle fracture or a recently performed ankle arthrodesis were recruited. Two different types of cast designs were used, one semi-rigid cast and one rigid cast. All fractures and arthrodesis healed well, with no major postoperative complications. Patient satisfaction was high in both groups and slightly higher in the semi-rigid group. This study shows that the ankle area can be immobilized using a novel type of a very light weight Woodcast® material. By combining soft and hard wood composite materials, an optimal open cast design leaving the calf area free can be performed, allowing full weight bearing and reliable immobilizing of the ankle. Immobilisation in fracture treatment has a long history. Fractures have been treated millennia with natural materials such as wood sticks, but it was only until 1852 that Plaster-of-Paris (POP) was first used in fracture treatment. Inorganic calcium based component had been traditionally used in building walls, but it required additional binding material to be used in limb immobilization. Cotton offered this possibility, and it was utilized almost simultaneously by two army doctors, Dutch Antonius Mathysen and Russian Nikolay Pirogov. It took a long time to get the first commercially available POP on the market (Cellona, Germany 1932). Typically, POP offered sufficient rigidity with relatively thick and heavy layers, allowing at least partial weight bearing. But it was also brittle and did not tolerate water. As a first improvement to POP, fiberglass was introduced to fracture treatment in the 1950s. It is lightweight, rigid or semi-rigid, and tolerates both water and continuous mechanical loading during walking. It is partially moldable with a strong net like support structure as a limiting factor [1-3]. Modern orthopedic plaster casts are commonly based on synthetic plastic that contains up to 25% methylene diphenyl diisocyanate (MDI). Severe issues have been raised in occupational health sector related to use of isocyanates used in modern paints, moldable glues and orthopaedic casting materials like fiberglass and polyurethane . Ankle fractures can be treated in a conservative way when certain criteria are fulfilled. Some centers prefer cast immobilization also after plate fixation, others rely more on ORIF stability and accept functional orthosis or free mobilization. If cast is to be used, it is however of one basic design regardless of material used. The leg and calf area are covered with a circular cast having different additional layers for sufficient stability [5-9]. Different kind of pre-shaped orthosis have come to the market, initially for functional treatment of ankle sprains, and in some studies also for treatment of ankle fractures [10-14]. In 2010, an innovative wood-composite material was introduced for fracture treatment by Onbone Oy, Helsinki, Finland. The Woodcast® material is an ecologically friendly, biodegradable, wood-plastic composite material, with absolutely free three-dimensional (3D) molding properties. Because of its extreme strength and exceptional molding properties, we hypothesized that it could be possible to treat common ankle fractures and postoperative immobilization in ankle arthrodesis with a novel, open cast design. The goal for the cast was to leave the calf area free, and to allow cast removal and reinserting without tools. Absolute requirements were that the new cast design has to be stiff enough to allow full weight bearing. This proof-of-concept type multicenter trial was conducted in accordance with the ethics principle originating in the latest version of the Declaration of Helsinki, applicable regulatory requirements, including the standards of the International Organization, and Finnish law and regulations. The study protocol was approved by the Ethics Committee of the Helsinki University Central Hospital (HUCH) and informed consent was obtained of the patients. The study was registered at www.clinicaltrials.gov. 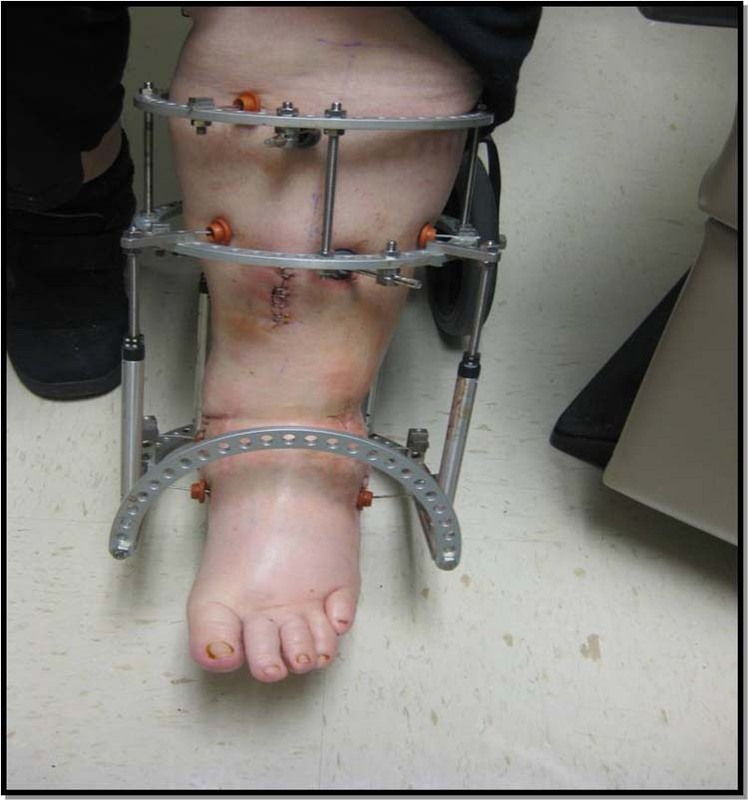 Major hypothesis were that novel light weight cast designs could be successful in treatment of ankle fractures and as postoperative supporting device after ankle arthrodesis. Woodcast® is a composite of thermoplastic polymer and a woody material approved for clinical use in limb immobilization (European approval in 2010). The material is hard in room and body temperature, but becomes moldable when heated up to +62 oC. During cooling, it retains moldable down to 45 oC offering extended working time. When ready, casting hardening can be enhanced with external cooling. The material is non-toxic, does not release irritant aerosols, and can be handled without protective gloves. It is strongly self-adhesive and slightly adhesive toward padding and bandage materials, but does not attach to skin. It can be composted after use. The Woodcast® materials can be reheated repeatedly without affecting their mechanical properties, and they can be stretched and bent freely in 3D. Thirty patients were enrolled in the study. The inclusion criteria were: Finnish or Swedish speaking patient, age between 0-90 years, a non-complicated ankle fracture or a performed elective foot arthrodesis normally requiring cast immobilization. The exclusion criteria were compromised co-operation for any reason, a complicated fracture, other simultaneous or earlier fractures, nerve, vessel or tendon injuries on the index extremity, malignancy and other severe diseases. Postoperatively the patients were treated with other casting materials for two weeks. After two weeks the postoperative cast was changed either to a Woodcast® semi-rigid ankle cast model (Group 1) or a rigid model (Group 2). The cast technicians were educated for both models and the choice of design depended on the hospital they were working in. Figure 1 A removable semi-rigid orthosis. The semi-rigid model was made of 80 cm long Woodcast® 2 mm Soft, 40 cm long Woodcast® 4 mm and of a 15 cm peace of Woodcast® 2mm. The Woodcast® 4 mm offers mechanical stability and the Soft product is used to achieve flexibility. The cast material was applied on the anterior part of the extremity leaving the posterior side of the extremity free and then allowed to cool. The cast was then removed and finalized with soft tape around the edges (Figure 1). Padding and Velcro tape were used. During the immobilization period the patients were allowed to remove the cast temporarily. The rigid cast was made of two 80 cm long Woodcast® 2mm pieces with paddings protecting the skin. A U-shaped casting material was applied from the lateral side, around the heel area and extending to medial side. The other 80 cm piece was cut oblique in two parts and applied anteriorly to stabilize the TC-joint and protect the plantar area during walking (Figure 2). Figure 2 A non-removable rigid cast. All patients completed the study. Thirteen (13/30) patients with ankle fractures were treated with the semi-rigid orthosis (Group 1). In 17/30 cases the rigid cast was used (Group 2) including 10 ankle arthrodesis patients and 7 trauma cases. In Group 1 the average age was 47.5 (the youngest patient being 24, and oldest 66 years old) and in group 2 the average age was 50.1 (the youngest patient being 24, and oldest 76 years old). Applying time was not depended on cast type rather skills of the technician. There were no major difference in immobilization time between Groups 1 and 2 (Table 1). The orthopedic technicians reported that no primary complications occurred in Group 1, although in one case orthosis soft material broke from the metatarsus area during the last week of immobilization, but didn’t cause complications for the patient. Twelve (12/13) of the patients in Group 1 reported that they removed the orthosis themselves during the immobilization at least once. Primary complications were reported by technicians in Group 2. Molding the cast was not easy in one case and in six of the cases there were issues applying the cast in correct position because of the multilayer composition. In two of the cases preheating the casting material didn’t occur fast enough. Table 1 Results of removable semi-rigid orthosis versus non-removable rigid cast. Patient satisfaction was high in both groups yet superficial skin complications were seen in Group 2. Superficial maceration reported in 6/17 cases, focal compression in the cast 3/17 and 3/17 both simultaneously (Table 1). One rigid cast was changed to the semi-rigid orthosis because of the increased level of moisture in the cast with good results. There were no skin complications in Group 1. There were no post-operative infections in either of the reported groups. Cast designs used in this study concentrate especially in immobilization of ankle joint and subtalar joint lines. Shortening the distal dimension in the cast gives more freedom to the toes, to the Lisfranc area, and finally to midtarsal Chopart joint line. This more targeted immobilization is possible with the specific material properties, but whether this has an effect on functional recovery remains to be seen in future studies. In acute ankle sprains (grades II & III), functional brace seems to give better outcome than total immobilization of the lower extremity [12,14]. It can be at least assumed that this kind of new material offers possibilities to design functional braces in the near future. The anteromedial margin of tibia is the area where soft tissue layers are thinnest. This offers a good contact area for bone immobilization, but requires good fitting of cast material. 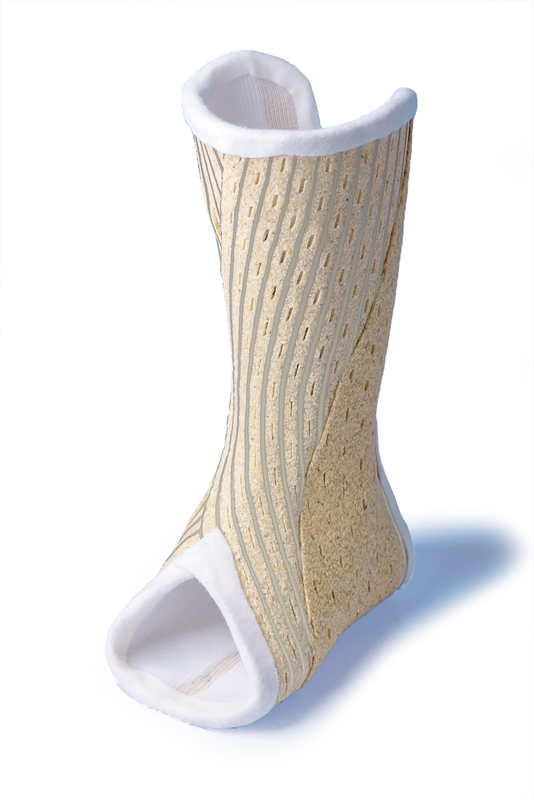 Cast designs used in this study utilize this area as an anchor site for ankle immobilization. Although no direct force measures were included in this study, our emphasis is that this is far more stable than padded circular cast around the whole calf area with soft tissues on the posterior area. No patient had discomfort on this anteromedial area, even with the use of hard material only. The hard version of Woodcast®, 4 mm and 2 mm are extremely stiff and durable materials. Hard material can be used as an internal support in elastic constructions, but if it is used as the only material attention must be paid on breathability and edges of cast design. Based on our experience in this relative small patient population, skin maceration and compression discomfort can occur in closed cast design. In Group 1, no patients with combined soft and hard material had cast related discomfort. This emphasizes the role of careful cast design, and use of appropriate padding. The immobilization or the cast itself can cause several complications. Pressure sores are common complications if improper techniques are used. The risk receiving pressure sores increases in patients who suffer from peripheral nerve or vessel disorders. 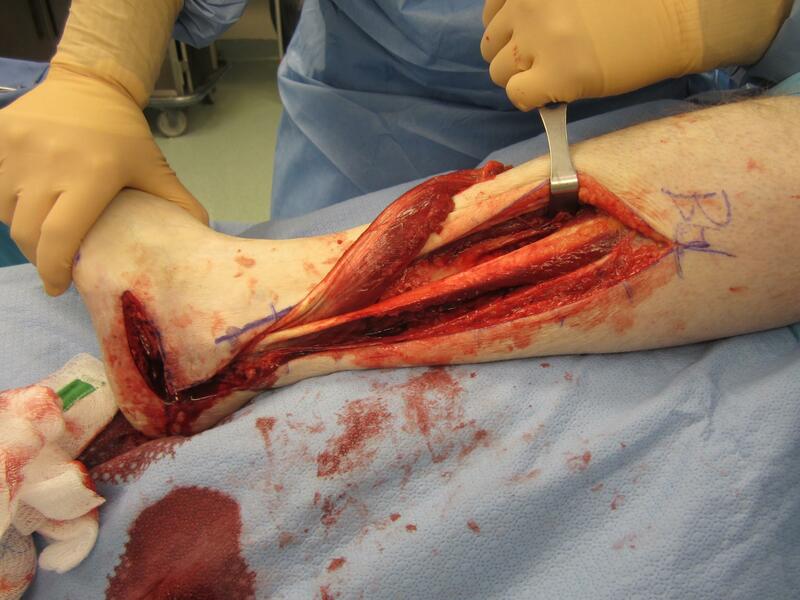 Compartment syndrome may develop due to a too tight cast . Immobilization may also lead to problems such as joint stiffness, muscle atrophy, cartilage degradation, ligament weakening and osteoporosis . Deep venous thrombosis (DVT) is perhaps the most common complication in lower extremity immobilization, with an incidence of 1.1% to 20% in various type of lower limb injuries treated with a circular cast . In this study, no DVT occurred although no prophylactic agents were used. The number of patients in this proof-of-concept study is too low to draw any solid conclusions on this, but it can be assumed that this type of novel cast design leaving the calf muscle area free could even decrease the risk of DVT. If a DVT is suspected, a circular cast has to be removed, but this open design allows ultrasound diagnostics directly with cast on. 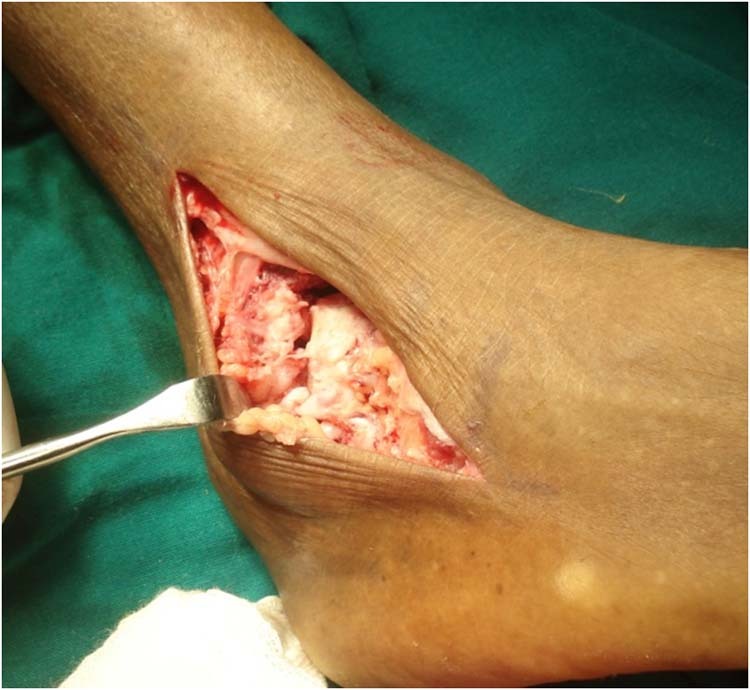 Achilles tendon ruptures are prone to wound complications . Although these ruptures were not in the scope of this study, it is evident that this kind of easily removable cast will fit well in treatment of these injuries. One advantage would be to monitor and treat wound complications even with the cast on. It also gives a direct access to healing tendon, either to monitor tendon healing with ultrasound, or possibly to stimulate tendon healing with external pulsating equipment. This study challenges the long-time circular cast design in ankle immobilization. It seems that even a semi-rigid open wood composite cast is safe and strong enough to stabilize common ankle fractures, and to successfully protect postoperative period after ankle arthrodesis. Taken together current data is very promising for an open type cast technology, further and larger studies are highly warranted. Tuberculosis (TB) is still endemic in many developed countries. Involvement of the ankle at presentation is extremely rare, and the diagnosis is often missed. Tuberculosis can involve pulmonary as well as extrapulmonary sites. The musculoskeletal system is involved in 1–3% of patients with TB. Although musculoskeletal TB has become uncommon in the Western world, it remains a huge problem in India . Isolated soft tissue TB is extremely rare. Early diagnosis and prompt treatment are mandatory to prevent serious destruction of joints. Due to the nonspecific and often indolent clinical presentation, the diagnosis may be delayed. Radiological assessment is often the first step in the diagnostic workup of patients with musculoskeletal TB and further investigations are decided by the findings on radiography. Both the radiologist and the clinician should be aware of the possibility of this diagnosis. The authors encountered a rare case of tubercular tenosynovitis of ankle with rice bodies. Key words: Tuberculosis, tenosynovitis, ankle, rice bodies, fibrin. Address correspondence to: Dr K P Raju, Dr J Mohan Kumar, Dr Roshan Shetty, BGS Global Hospital & BGS GIMS, Bengaluru,India. Tuberculous tenosynovitis was first described by Acrel in 1777. Particles are named “rice body”, due to their resemblance to shiny rice grains, was first described by Reise in1895. Rice body formation may occur with a systemic inflammatory disease or alone in localized form. While it is mostly seen in patients with rheumatoid arthritis, it may also be accompanied by juvenile rheumatoid arthritis,[3,4] tuberculous arthritis, tuberculous tenosynovitis and tuberculous bursitis, atypical mycobacterial tenosynovitis,[7,8] osteoarthritis, in addition to nonspecific arthritis, tenosynovitis, and bursitis. Rice body formation may occur in intra-articular structures, at tendon insertions and synovial structures like periarticular bursa of the shoulder, knee, wrist and ankles, which are the most common sites of involvement. [2,5] Both primary tuberculous bursitis and tenosynovitis are rare conditions. Diagnosis with classical radiography is challenging. Arthrography, bursography, ultrasonography (USG) and magnetic resonance imaging (MRI) are useful techniques in preoperative diagnosis. 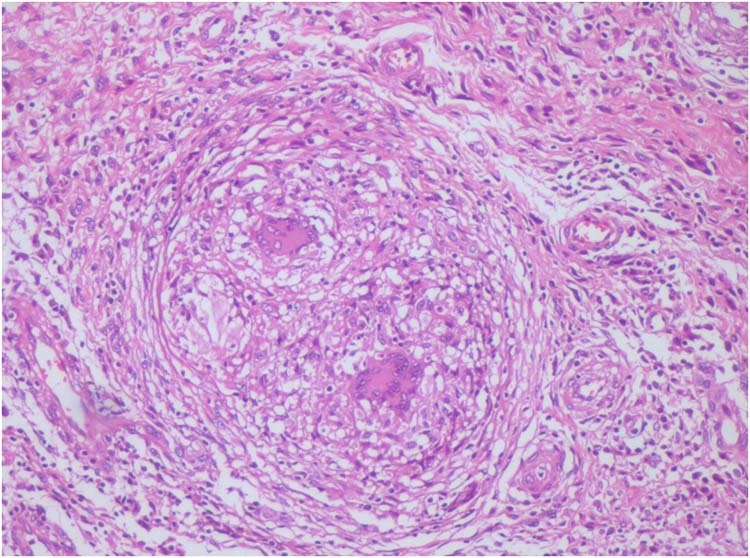 The histological structure usually comprises an amorphous core of necrotic cells in the center, surrounded by a layer of fibrin and collagen. We present a case of rice body formation in tubercular tenosynovitis of ankle, without any systemic disease. The case was diagnosed as rice body formation secondary to tubercular tenosynovitis of peroneal tendon, based on the MRI findings, intraoperative appearance, and histopathological report. Antituberculous treatment was started as soon as the identification of M. tuberculosis was confirmed. After one year of treatment the patient had full range of motion without pain. Recurrence was not observed during the two year follow-up period. Rice bodies are free particles that have a cartilage-like shiny appearance, can reach high numbers, and are of synovial origin. There is no consensus on the etiology. The condition is believed to develop as a nonspecific response to synovial inflammation. Synovial ischemia and necrosis due to hypoxia, caused by the disruption of microcirculation, are thought to be the triggering factors. Rice bodies are formed by the necrotized particles which break away from the synovium and adhere to the fibrin in the joint space, tendon sheath or inside the bursa. After phagocytosis by the macrophages they are denatured in phagolysosomes and by acting like collagen antigens they lead to an auto-immune response. Another hypothesis suggests that collagen, newly synthesized by synovial cells, can lead to formation of rice bodies. It should be, however, kept in mind that the condition might be misinterpreted as synovial chondromatosis. In the literature, it is emphasized that pathological misdiagnosis is possible and there is no evidence of cartilage tissue presence in rice bodies. Histopathological examination of our case, likewise, presented no sign of cartilage tissue in the bodies. Some authors have advocated that the emergence of rice bodies is due to a new formation caused by the progressive growth of fibronectin and fibrin aggregates in the synovial fluid, independent from the synovial elements. [11,13] While 47% of the synovial protein is composed of collagen in rheumatic diseases, in rice body proteins this percentage is only 10%. Rice bodies are richer in fibrin. However, Popert, et al., have shown the particles are not homogenous. While some rice bodies are mostly formed of fibrin, some are composed of synovial membrane. Some others are formed of synovial core surrounded by fibrin. [11,12] Muirhead et al., in their ultrastructural study, reported that rice bodies can be of multiple origins based on their localizations. In our study, pathological examination of the excised bodies presented a structure with synovial necrosis and fibrin deposition in the center. Looking at the MR images of our case and other patients, we believe the T2-weighted images can be an important criterion in diagnosis and differential diagnosis. Although symptomatic improvements with long-acting steroids, aspiration and lavage have been reported, basic approach in the treatment is surgical excision. [13,18] No recurrence was observed in the follow-up period of two years, following the excision of rice bodies in our case. It should be kept in mind that rice bodies can be seen in an extra-articular localization and with no association with a systemic inflammatory disease. Clinical examination and MRI are of great importance in diagnosis and surgical excision will provide a safe and definitive treatment. 1. Reise H. Die Reiskorpschen in tuberculserkrankensynovalsacken. Deutsche Zeitschrift für Chirurgie, vol. 42, p. 1, 1895 (German). 4. Cuomo A, Pirpiris M, Otsuka NY. Case report: biceps tenosynovial rice bodies. J Pediatr Orthop B 2006 15: 423-425. 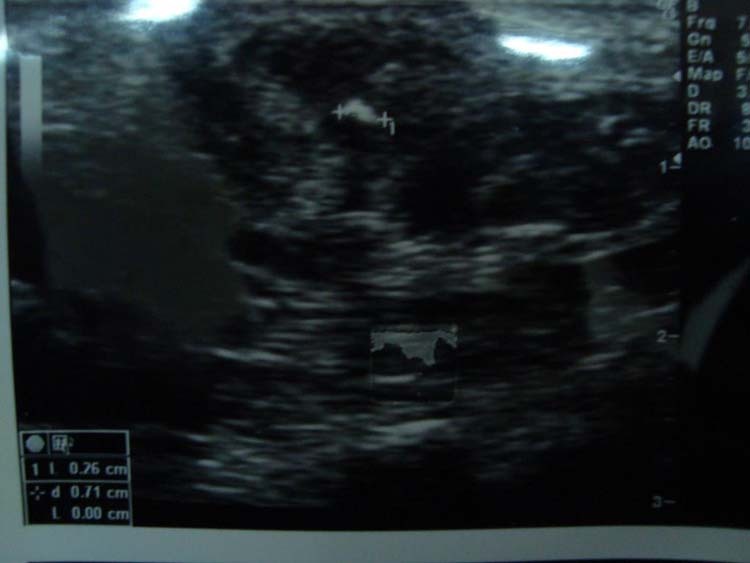 A prospective case series was undertaken to assess the role of high resolution ultrasonography to detect radiolucent foreign bodies in the foot and ankle region. Out of 30 suspected foreign bodies, ultrasonography was able to detect 28 foreign bodies with 2 false negatives. The overall sensitivity was 93.33%. The false negatives were attributed to the foreign body being obscured by bone. Missed or neglected foreign body and subsequent complications in the extremities is a challenging complaint in the orthopedic outpatient department. Most of these cases present with soft tissue mass, granuloma, abscess, corns, osteomyelitis, fasciitis, cellulitis, chronic discharging sinus, and tendon contracture with or without pain. [1,2,3] The initial investigation is usually done with a plain radiograph, which however, cannot detect radiolucent foreign bodies such as those of wood, plastic and rubber. Computerized tomographic (CT) scan has the ability to detect the radiolucent foreign bodies with limitations of ionizing radiation, cost and poor sensitivity in detecting small foreign bodies. 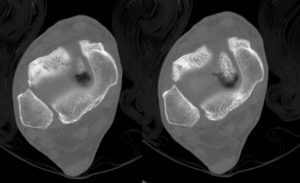 [6,7] Magnetic Resonance Imaging (MRI) can detect radiolucent foreign bodies but has the limitations of being inaccessible, expensive, and a concern regarding magnetic foreign bodies as well as time consuming. Figure 1 and Figure 2 High-resolution ultrasound of a foot suspected of having a foreign body. There is an added disadvantage of not detecting foreign bodies with low signal intensity from tissues such as scar tissue, tendon and calcifications. [8,9] Sonography, on the other hand, is easily accessible, inexpensive and a time saving image modality. We undertook our study on thirty patients who presented to our outpatient department at two hospitals with a definite history of foreign body injury to the foot and ankle region. Patients presented with varied signs and symptoms which included pain, soft tissue mass, abscess, corn, chronic discharging sinus with duration of symptoms ranging from four months to eight years. Most of these patients were initially managed by primary care givers and missed or often self treated themselves removing only a part of foreign body and subsequently neglected. Our aim was to assess the role of foreign body detection in these patients with high resolution ultra sonography (USG). Thirty symptomatic patients who had a definite history of foreign body injury of the foot and ankle region were included in this study. The symptoms of these patients varied from simple pain to chronic discharging sinus and all had a normal plain radiograph. All of them underwent high resolution ultra sonography of the affected part followed by surgical exploration. Sonography was conducted by four specialist doctors who had a minimum of four years of experience in the radiology department. Sensitivity of USG was determined with respect to that found on surgical exploration. Thirty consecutive patients presented to our outpatient departments from May 2008 to May 2012 with history of foreign body injury. Patients presented with persistent pain, soft tissue mass, granuloma, abscess or chronic discharging sinus with a normal radiograph. Nineteen patients were male. Twenty two patients were younger than twenty years of age. Twenty eight patients had symptoms in the foot; two had symptoms in the ankle region. Twenty three patients had a history of nail insertion in the foot through a rubber sole. 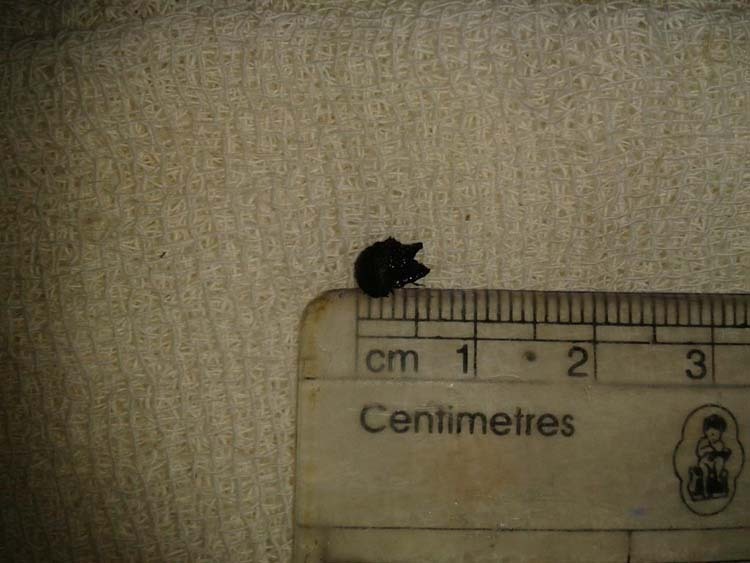 There was thorn injury in six patients with five having it in the foot and one in the ankle region. One patient had injury to the ankle with a wood. Three patients had multiple surgical interventions for chronic discharging sinuses. All these patients were sent to radiology for the high resolution ultra sonography of the affected part. In all our cases a frequency of 7.5 MHz to 13 MHz was employed. Foreign bodies were reported as hyperechoic masses with surrounding hypo echoic rim with an acoustic shadow in twenty eight patients (Fig. 1 and Fig. 2). Figure 3 Foreign body seen at the time of surgery. Two patients which were reported negative had chronic discharging sinus with one having it on the lateral malleolus and another on the dorsal aspect of the foot. All patients underwent surgical exploration under general or regional anaesthesia with tourniquet control. Preoperative methylene blue injection into the sinus was used in three patients with chronic discharging sinus. Foreign bodies were recovered from all the patients (Fig. 3 and Fig. 4). Two patients who were labeled by the sonologist of not having a foreign body had foreign bodies close to or obscured by the bone. One of the patients had injury to the right lateral malleolar area with a wooden foreign body with persistent sinus discharge, and on exploration the foreign body was found very close to and abutting the cortex. Another patient had a history of nail insertion through the sole of the shoe with persistent sinus discharge on the planter aspect of the foot, and on surgical exploration a piece of rubber was found abutting the second metatarsal shaft cortex on the dorsal aspect. Out of the total thirty suspected radiolucent foreign bodies, high resolution ultra sonography was able to detect the foreign body in 28 patients with two false negatives with an overall sensitivity of 93.33%. Figure 4 Foreign body after removal. The basic principle of ultra sound is the use of a transducer to penetrate tissues with ultrasonic waves at various frequencies. When the wave strikes the denser component of tissue, they bounce (echo) back to the transducer. The ultrasound can then interpret the speed and intensity of the sound wave to determine the location and composition of the object. Structures are plotted on the screen based on their depth and location relative to the transducer. Superficial structures are plotted at the top and deeper ones at the bottom of the screen. The larger the surface area toward the transducer the greater it will reflect. Sonographic features of the foreign bodies in the soft tissues have three components. Firstly, the appearance of the foreign body; secondly, the changes in the soft tissues surrounding the foreign bodies. Thirdly, the appearance of soft tissues distal to the foreign bodies. All foreign bodies on ultrasonography appear as hyperechoic foci. The reflectivity depends on acoustic impedance of the foreign body which in turn varies with the density of the object. In general, metal, mineral, glass, wood, and rubber reflect sound, appearing white on the screen. The changes surrounding the foreign bodies are due to inflammatory reaction which may range from edema to abscess formation. Despite their size, foreign bodies are no small matter. When left untreated they cause pain, swelling, infection, nerve and tendon injury. [2,3,12] Although USG has been a well-established diagnostic tool for foreign bodies in the soft tissues, it has been underutilized in this part of the world. While evaluating the usefulness of USG in the detection of unsuspected foreign bodies followed by CT, MRI, bone and labeled red cell Scintigraphy, it has been found that the later investigations added no relevant information and were time consuming and costly. The sensitivity of USG in detecting different foreign bodies has been reported to be 70% to 100%. Cases which turned out to be false negatives had either a very deep foreign body, gas around foreign body, or a foreign body too close to the bone [8,13,14,15] as was the case in two of our patients. Several studies have demonstrated the effectiveness of USG in detecting non-opaque foreign bodies in the soft tissues. The power of USG is as important as the depth of penetration of wave into soft tissues. The shorter wave length with high frequency penetrates less as most of energy is absorbed by the medium. The authors do not believe that the results could be different if the USG was done by the same radiologists. Differences in the comparative accuracy, sensitivity and specificity of foreign body detection by radiologist and USG technician has not been found to be statistically significant in the previous studies. The authors do not recommend replacing plain radiography with ultrasonography in the evaluation of suspected foreign bodies of the foot and ankle region. But Sonography should definitely be considered part of diagnostic work up of patients in whom we strongly suspect the presence of radiolucent foreign bodies based on history and symptomatology. Malignant fibrous histiocytomas are a rare soft tissue sarcoma that present as indolent tumors in adults. Treatment consists of wide surgical excision. Local recurrence and metastasis is common and patients must be followed for such. We describe the case of a 49 year-old male that presented with a painless “lump” on the front of his ankle. Magnetic resonance imaging showed a 2.6 x 3.5 x 4.3 cm lesion that displayed high intensity on the T2 weighted image. The mass partially encased the tibialis anterior tendon along the medial aspect without invading the body of the tendon. The radiologist suspected a possible malignant neoplasm including synovial sarcoma or giant cell tumor of the tendon sheath. The patient underwent wide excision of the lesion and pathology diagnosed it as malignant fibrous histiocytoma at the anterior ankle. The patient underwent limb sparing surgery without adjuvant chemotherapy and after 2 years of follow-up he has had no recurrence or metastasis. MFH most commonly metastasizes to the lungs and patients should be followed with regular chest radiographs. Recurrence most commonly occurs within 2 years. The treatment consists of primary resection with adjuvant chemotherapy depending on clear margins, depth and lymph node involvement. A 49 year-old gentleman presented to our clinic with a complaint of a “bump” of the anterior medial ankle. The patient noted only minimal discomfort with high topped shoes or work type boots, as they would press directly on the lesion and cause irritation. Figure 1 Magnetic resonance image of the soft tissue sarcoma. (A) Axial view (B) Longitudinal view. The lesion had been present for at least one year, and was progressively growing over the past few months. No history of trauma to the area was noted and he had no previous treatment for the lesion. The medical history was significant for hypertension, sleep apnea and chronic back pain. He had previous umbilical and inguinal hernia repair, a knee arthroscopy and mucocele removal. He denied any other lesions, similar to the one on his foot, anywhere on his body. On physical examination, there was a round, mildly fluctuant, rubbery golf-ball sized lesion measuring approximately 3.5 cm in diameter along the lateral aspect of the tibialis anterior tendon. The lesion was fairly mobile underneath the skin and transillumination was not possible. It was fairly painless to palpation, leading to the suspicion that the mass was merely irritated by rubbing, or direct pressure from shoegear. There was no surrounding erythema, edema, ulceration or telangiectasias associated with the lesion. Dorsalis pedis and posterior tibial pulses were palpable and capillary filling time was instantaneous to all digits bilaterally. Tinel’s sign was not elicited on percussion of the mass and sharp-dull, light touch and vibratory sensation were intact. Manual muscle testing was within normal limits and the lesion was noted to translocate with dorsiflexion and plantar flexion of the ankle. Plain films revealed a large soft tissue rounded density anteriorly and medially overlying the right ankle without any definitive underlying bony abnormality. The patient was then sent for magnetic resonance imaging (MRI) to determine the characteristics of the lesion. The lesion measured 2.6 x 3.5 x 4.3cm and displayed high signal intensity and intense enhancement on the T2 weighted image. (Fig. 1) The mass partially encased the tibialis anterior tendon along the medial aspect without invading the body of the tendon. The radiologist suspected a possible malignant neoplasm due to the intense enhancement and size with differential diagnoses including synovial sarcoma or giant cell tumor of the tendon sheath. Due to the suspicious nature of the lesion and for surgical planning a core needle biopsy was performed to obtain a clearer diagnosis. Figure 2 Gross specimen of soft tissue sarcoma. Although it appeared to be encapsulated, it was not entirely circumscribed and included a transected margin with mitotically active pleomorphic cells. 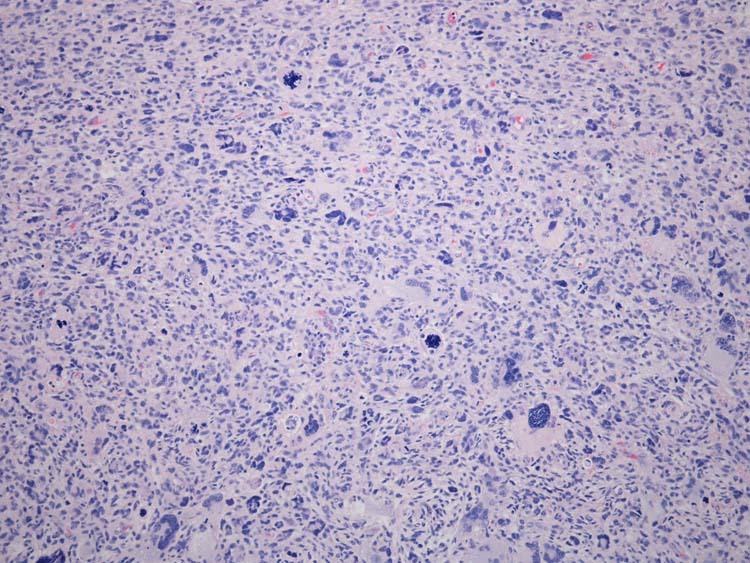 Figure 3 Histological assessment reveals an area of pleomorphic tumor with bizarre giant cells and very high mitotic rate including abnormal mitoses (10x power/hematoxylin and eosin stain). Due to the malignant finding and the incomplete margin a surgical oncologist was consulted. The patient returned to the operating room where a wide local excision of the area was performed. The resected tissue was examined, and no further remnants of the lesion were seen at the margins. A full thickness skin graft of the area was taken from the patient’s thigh and subsequently placed on the wound bed. The patient was kept non-weight bearing in an off-loading boot and subsequent local wound care was performed until complete healing was achieved. Approximately 5 months later the patient developed a firm, well-demarcated lesion directly adjacent to the previous surgical margin. An MRI revealed a 5.1 x 4.5 x 4.0 mm mass just superficial but abutting the extensor digitorum longus tendons. This lesion was intermediate on T1 and increased on T2, showing a relatively homogenous enhancement. Due to its small nature it was difficult to differentiate between the vessels in the vicinity. Because of the patients’ history he was taken back to the operating room. A 5cm linear incision was made over the mass. The incision was deepened to the level of the superficial peroneal nerve where the mass was visualized within the nerve’s fibers. It was traced proximally and distally and the entire nerve and lesion were removed in toto. Further inspection of the area revealed no additional lesions. Pathologic exam identified the 1.2 x 0.9 x 0.3cm specimen as a traumatic neuroma of the intermediate branch of the superficial peroneal nerve. The patient is currently being followed for another pea-sized lesion that was discovered 3 months after his second surgery. It is approximately 2 mm in diameter, is movable and lies just proximal to the second surgical margin along the course of the superficial peroneal nerve. We are following him for any growth in this lesion and do not have any current plans for further surgical intervention. Due to both of his surgeries the patient has numbness to the dorsum of his foot. He has no residual weakness to any of the muscle groups to his foot and has noticed no other lesions anywhere else on his body, with exception to the foot. The patient has also had serial chest radiographs that have shown no metastases. Malignant fibrous histiocytoma (MFH), first described in the sixties, is the most common soft tissue sarcoma in adults. It occurs most often in the proximal portions of the extremities including the thigh and buttocks.1 The mean age is 55.8 with a range of 18 to 84 years and equally affects males and females. Most patients present with an asymptomatic tumor that they have noticed in less than a year. Initial diagnosis is frequently attained by biopsy and MRI is useful in surgical planning. This requires sampling from several areas of the tumor as the histological sample can vary from location to location. There is no specific immunohistochemical marker for MFH, so the diagnosis is usually one of exclusion.8 MFH are classified using immunohistochemical methods for type and grade according to the system of Enzinger and Weiss with the lower grades signifying level of differentiation. The histology of MFH is variable and several subtypes including storiform-pleomorphic, myxoid, giant cell and inflammatory exist with the storiform-pleomorphic being the most common. All variants may be locally aggressive and surgical excision is required. Metastasis is a significant concern in patients diagnosed with MFH. Peiper, et al., found of 458 patients 29 developed metastases after a median of 12 months, with the most common, 80%, seeding to the lungs. Prognostic risk factors for distant metastases include tumor size, depth and grade (based on the classification of Enzinger and Weiss). The annual risk of distant metastases was 3.5 times higher in patients with higher grade tumors. In conclusion, although MFH is the most common soft tissue sarcoma in adults, it is still a rare diagnosis especially in the distal extremity. In 24 months of follow-up our patient had an additional lesion diagnosed as a traumatic neuroma although approximately 30% of patients will have a second MFH. He has had no evidence of metastasis to this date and is monitored every 3 months with a physical exam and chest radiograph. Ankle arthrodesis is commonly considered to be the standard operative treatment for end stage ankle arthritis. 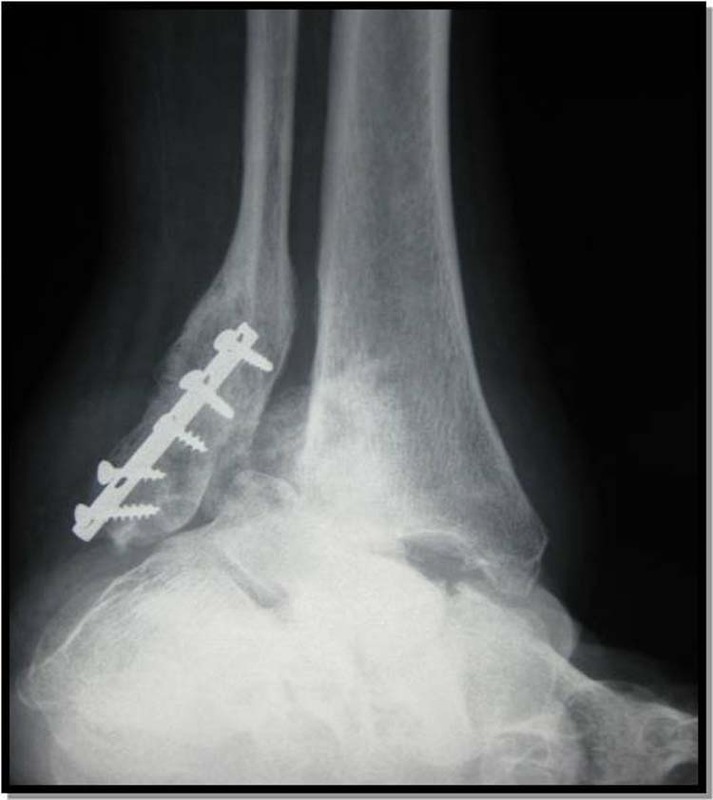 The purpose of this study was to perform a clinical and radiographic review to determine functional outcome for a group of patients in whom an ankle arthrodesis had been performed using Charnley’s compression device. 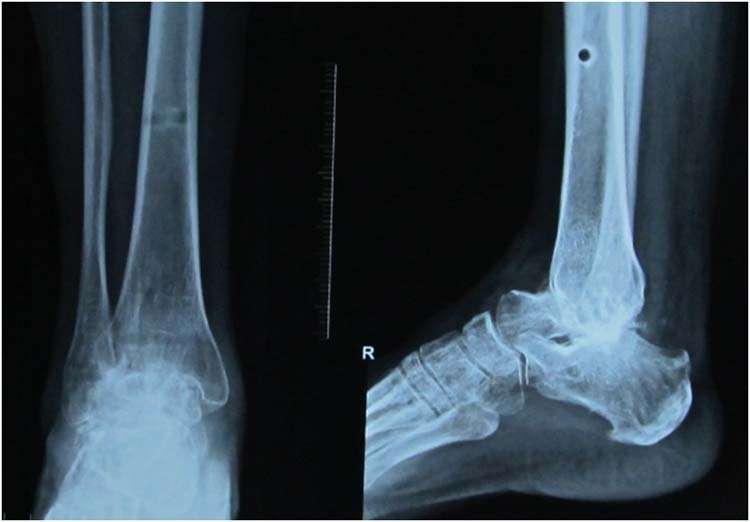 A functional assessment of fifteen patients after ankle arthrodesis for post traumatic arthritis was carried out by means of an extensive clinical evaluation after an average follow up of 2 years and 8 months. Key words: Ankle arthrodesis, ankle arthritis, Charnley’s compression device, secondary arthritis ankle. Since 1879, when Albert first described arthrodesis of the ankle , more than thirty different techniques have been described. The open technique with compression and internal fixation is still widely used for ankle arthrodesis with major deformity. Ankle arthrodesis is an alternative for cases with intact subtalar joint. This study presents intermediate term follow up functional outcome of patients with ankle arthrodesis performed using Charnley’s compression device. 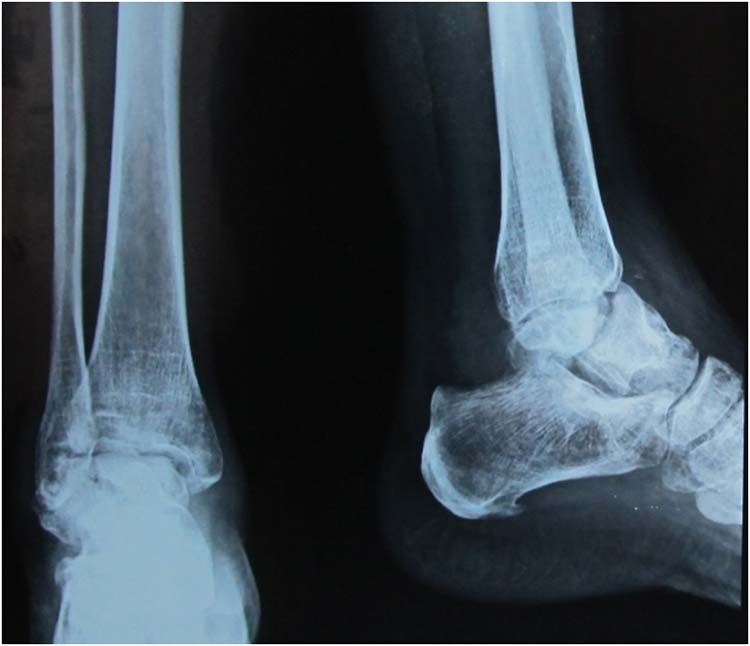 We reviewed fifteen patients, 10 males and 5 females, who had undergone ankle arthrodesis between January 2006 to December 2009 at the People’s Education Society (PES) Medical College and Research Center, Kuppam, Andhra Pradesh (AP), India (6 cases of post traumatic AVN talus (Fig. 1), 4 cases malunited bimalleolar fracture, 3 cases of distal tibial plafond fractures, 2 cases of medial malleoli non-union). All the fifteen patients who had secondary ankle arthritis have undergone open ankle fusion with anterolateral approach (Fig. 2) in supine position under tourniquet control and spinal anaesthesia. 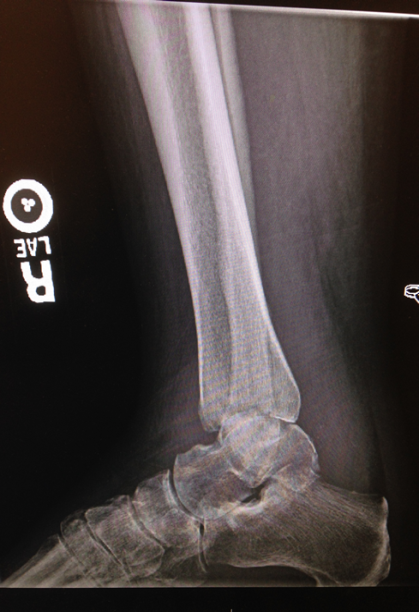 Figure 1 Preoperative radiograph right ankle showing arthritic changes secondary to non union talar neck fracture. 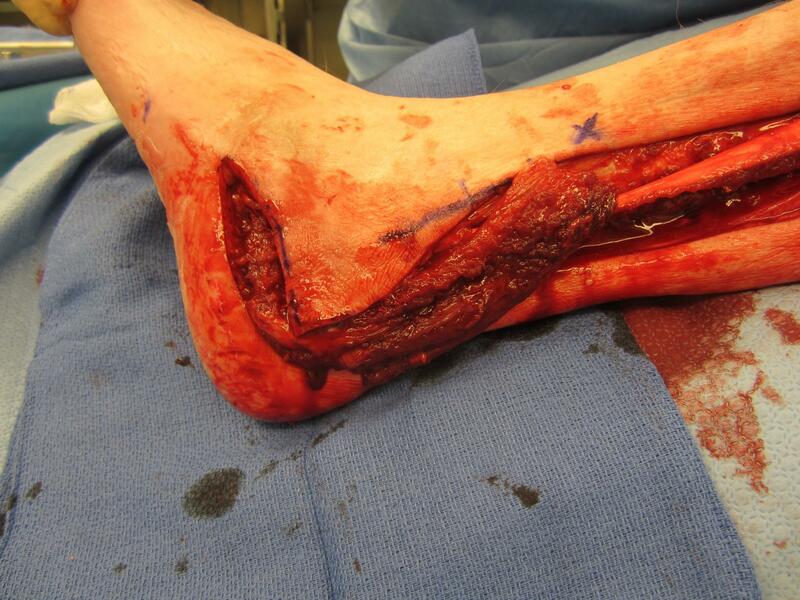 Figure 2 Intraoperative photo showing anterolateral approach to ankle. 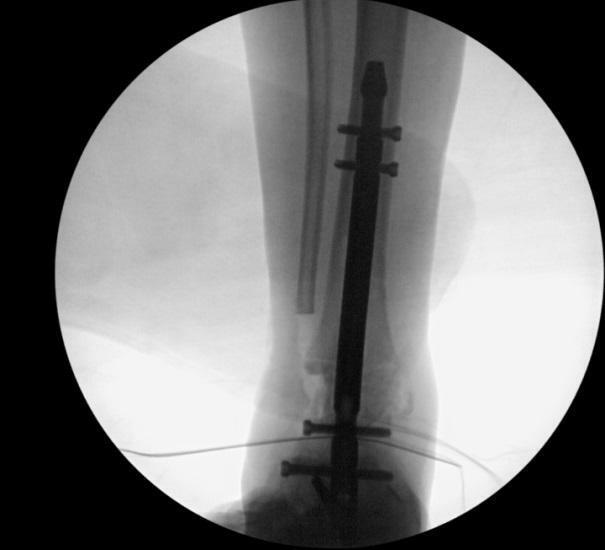 Compression was achieved using Charnley’s compression device and a calcaneotibial Steinman pin was applied to maintain the alignment and to increase the stability of fixation (Figs. 3 and 4). Suction drain was removed after 48 hours and the patient was made ambulant with non weight on operated site. 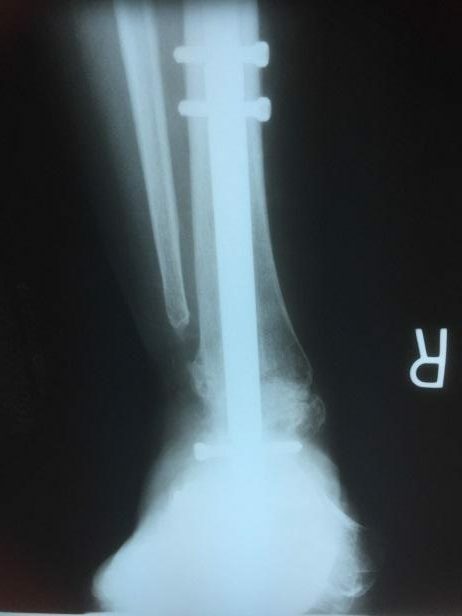 All the patients were evaluated clinically and radiologically at 6 weeks and tibiocalcaneal Steinman pin was removed and the patients were allowed to bear weight as tolerated. 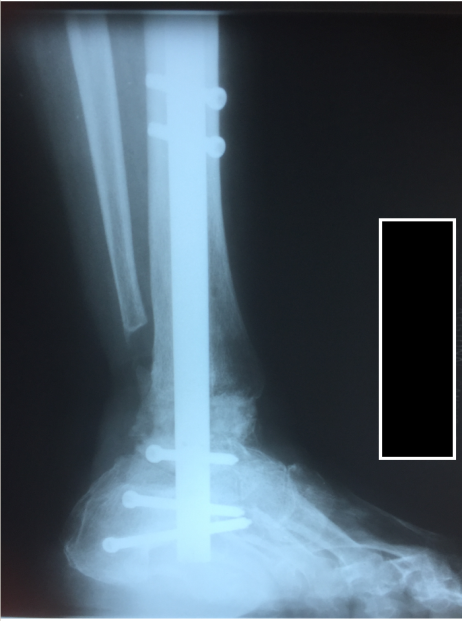 All the fixators were removed after 12 weeks once the arthrodesis site was united radiologically. We had 3 cases of cellulitis of ankle and foot which was treated successfully with antibiotics, and 5 cases of superficial pin tract infection which were healed completely after fixator removal. None of these pin tract infections caused osteomyelitis. The mean age at the time of surgery was 40.52 years (24 – 56 years) and the time interval between the date of fusion and date of follow up examination ranged from 1 year to 5 years and 7 months, the average being 2 years 8 months. Figure 3 Immediate post operative radiograph showing Charnley’s compression device. Figure 4 Clinical photo showing Charnley’s compression device. The clinical evaluation was based on a personal interview and physical examination. The patients were questioned as to their pain during daily activities such as running or walking on the level ground and going up and down the hills and stairs. A complete orthopaedic examination evaluated stance, gait, limb length discrepancy, circumference, range of motion of the knees, ankles, and subtalar joints; neurovascular status muscle strength and presence or absence of tenderness and swelling. Special attention was directed to the position of the fused ankle and the motion of the subtalar and mid tarsal joints. Any valgus or varus deformities of the heel and the presence of the callosities were also determined. The contralateral extremity was used as a control. 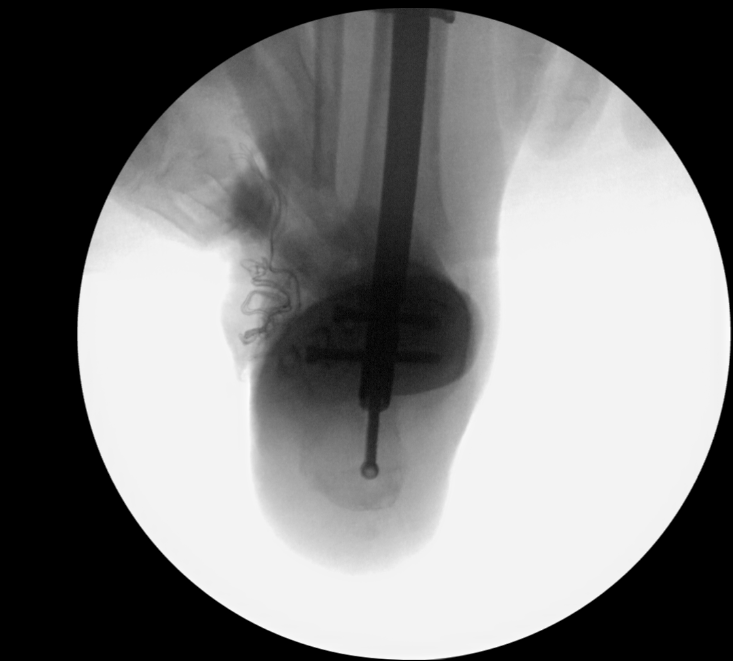 Ankle anterior posterior and lateral radiographs were taken to assess the fusion and position of the arthrodesis (Fig. 5). Figure 5 Two year follow up radiographs shows solid union at the arthrodesis site. To quantitate the results of the clinical examination the American Orthopaedic Foot and Ankle Society (AOFAS) Ankle-Hindfoot scale was used. The main emphasis of this system was on pain and the functional activities. A normal person would score 100 points. Because of lack of ankle motion, the maximum score that the patient with an ankle fusion could have was 92, since they could not earn the 8 points given for the full range of motion. A score of 80 to 92 was considered an excellent result: 70 to 79, a good result; 60 to 69, a fair result; and score less than 60 was considered a poor result. 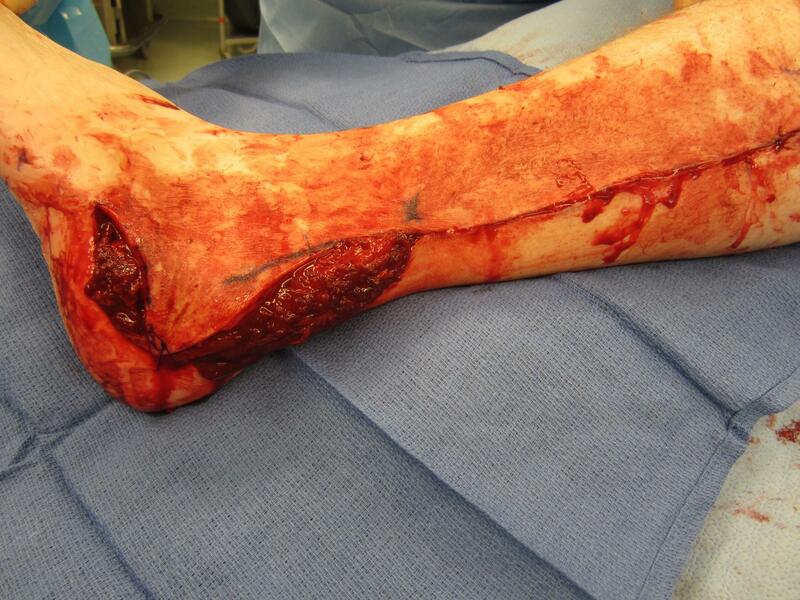 All patients studied had a solidly fused ankle and had no complications related to the surgery (Fig 6). They were all improved as a result of ankle fusion and returned to their pre injury activities. Wearing shoes with appropriate heels, all the patients could walk on level ground without support. All the patients stated that they could walk up and down the stairs without much difficulty. 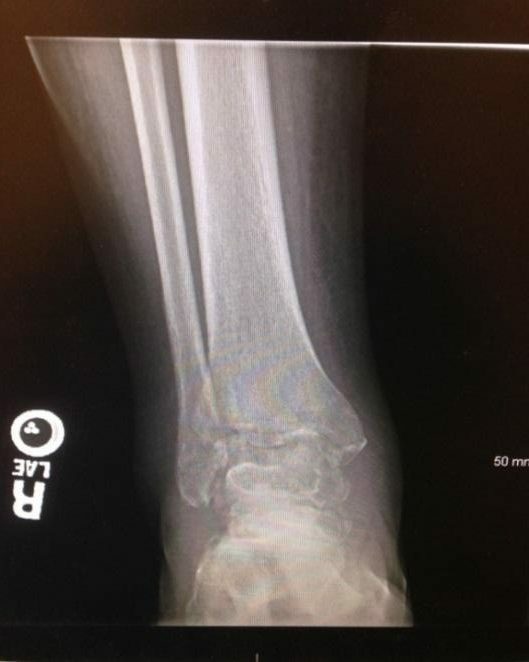 Limb length discrepancies were insignificant (0.5 to 1.5 cm) except in one patient who had 2.5 cm secondarily due to distal tibial plafond fracture. The radiographs showed that 6 cases showed some evidence of degenerative changes in the subtalar joints which did not correlate with the symptoms. Figure 6 Two year follow up clinical photo of right ankle arthrodesis showing very litte difference compared to left normal side. Scoring the patients with the American Orthopaedic Foot and Ankle Society (AOFAS) Ankle-Hindfoot scale, we found that eleven of the 15 had excellent results; two good; and two fair results. All of them could walk with relatively good velocity and with a consistently rhythmic gait. The patients with solid ankle fusion in this study functioned very well during the activities of normal daily living. All of them could walk on the level ground without pain. The fusion had permitted them to return to their former occupations and recreational activities. On this basis all the patients could be classified as having very satisfactory results. Based on the American Orthopaedic Foot and Ankle Society (AOFAS) Ankle-Hindfoot scale, these patients had appreciable limitations when walking barefoot but only mild to moderate limitations when wearing proper footwear. Patients were assessed not only under normal conditions but also under stressful conditions such as walking long distances, climbing up and down the stairs, and running. Six of the 15 could not run. Three had some minor discomfort after walking long distance. Charnley’s compression devise is still a simple, cost effective and excellent external fixator which can be used easily by every orthopaedic surgeon. After removal of the fixator, there is no indication for additional surgery to remove the implant compared to internal fixation. There are no hardware problems as all the hardware was removed. The high level of satisfaction in this group of patients reinforces the view that open arthrodesis using Charnley’s compression device, as opposed to ankle replacement or arthroscopic arthrodesis, continues to be the treatment of choice when there is severe varus or valgus deformity associated with the arthritis. Although ankle arthrodesis may provide good early relief of pain, it is associated with premature deterioration of other joints of the foot and eventual arthritis, pain, and dysfunction. [12-13] In studies ranging in size from 12 to 101 patients, rates of successful primary ankle fusion of 80% to 100% have been reported earlier. [14-18] However an average follow up time of 2 years and 8 months is relatively short to comment on the future secondary osteoarthritic changes in the subtalar and mid foot joints. Subjectively and objectively, the patients with ankle fusion function quite well in activities of daily living provided that, they have enough compensatory motion in the Chopart’s and Lisfranc joints of the foot, the other ankle has a normal range of motion, they wear footwear with appropriate height. On the basis of these results, patients should be counseled that an ankle fusion will help to relieve pain and to improve overall function; however, it is a salvage procedure that will cause persistent alterations in gait with a potential for deterioration due to the development of ipsilateral hindfoot arthritis. Charnley’s compression device can still be considered as the fixator of choice compared to other modalities available with respect to cost, simplicity and good outcome. 8. Albert E. Zur Resektion des Kniegelenkes. Wien Med. Press, 1879 20: 705-708. 1 Asst. Professor, Dept. of Orthopaedics, PES Medical College, Kuppam, Chittore dist., Andra Pradesh, India, 517425. 2 Asst. Professor, Dept. of Orthopaedics, PES Medical College, Kuppam, Chittore dist., Andra Pradesh, India, 517425. Adhesive capsulitis is a well known ailment that most often affects the shoulder, but can occur in the hip, wrist, and the ankle. As it relates to the ankle joint, the condition is commonly referred to as ‘frozen ankle’ and presents as a challenge in both its diagnosis and treatment. Although there is much literature regarding the etiology, pathology, and treatment of ‘frozen shoulder’, there is little with regards to the ankle, with most being case reports. The purpose of this article is to provide a clinical review of the concept of adhesive capsulitis, its impact as it relates to the ankle, diagnostic criteria, and current treatment modalities. Key words: Adhesive capsulitis, frozen ankle, ankle pain, adhesions. Adhesive capsulitis is a broad term that can be confusing at times since it is often used synonymously for “frozen shoulder”. In order to better understand adhesive capsulitis of the ankle, we begin with a brief review of a better documented phenomenon concerning the shoulder. Adhesive capsulitis of the shoulder is a common condition that will cause pain and restrictions during active and passive range of motions (ROM). Adhesive Capsulitis of the Ankle (ACA) is infrequently reported in the literature, but the few reports that do exist suggest that it occurs secondary to trauma such as ankle or pilon fractures or chronic ankle sprains. With regards to pathophysiology, the literature between adhesive capsulitis of the shoulder and that of the ankle appears to be synchronous. Not only is the site of injury affected, but the entire joint capsule is disturbed, resulting in a global loss of motion. 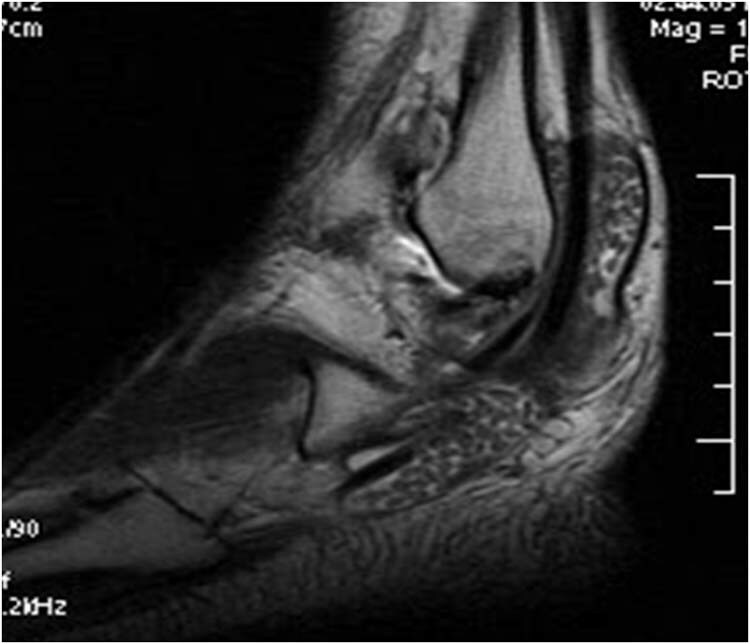 Figure 1 Sagittal FSE T2 weighted image in a patient with post traumatic and postsurgical ACA showing complete paucity of synovial fluid in the ankle joint (long arrow) and in the posterior subtalar joint (short arrow). Note magnetic susceptibility artifact (star) from surgical hardware. Figure 2 Normal ankle with normal fluid in the ankle (long arrow) and posterior recess of the posterior subtalar joint (short arrow). Additionally, a hallmark technique in the diagnosis and treatment at the level of the shoulder is the feeling of a capsular end feel with passive range of motion testing, or in stage 3; a rigid end point. 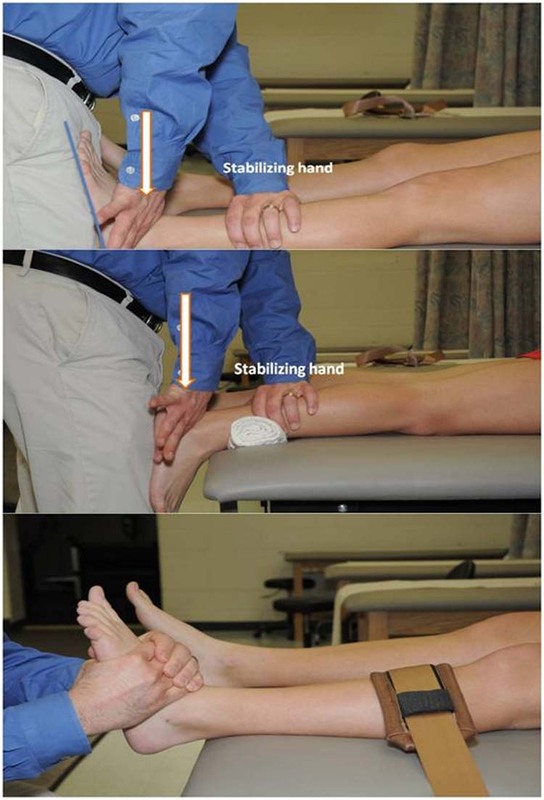 This diagnostic exam technique along with acknowledging restricted joint play on attempted anterior, posterior, and distraction joint mobilization can be applied in the diagnostic approach to the ankle as well. Currently, treatment options for the ankle include physical therapy focusing on active and passive range of motion as well as ankle joint mobilization techniques. (Figs. 3A, 3B and 3C) Shaffer, et al., showed that after 8 weeks of immobilization post-ankle fracture, 10 weeks of mobilization with physical therapy can successfully restore ROM, strength, and function of the ankle joint. If conservative care is unsuccessful, arthroscopic debridement may be necessary. Lui, et al., found that ankle ROM may improve up to 18° with DF and up to 23° with PF post-arthroscopic debridement. Figure 4 A diagnostic and treatment algorithm adapted from Cui, et al., Copyright © 2011 by the American Orthopaedic Foot and Ankle Society, Inc., originally published in Foot & Ankle International, 26(8):606 and reproduced here with permission. Adhesive capsulitis of the ankle is a difficult condition to diagnose and manage. Careful review of existing literature reveals limited research on the subject, with most studies being directed towards adhesive capsulitis of the shoulder. Such shoulder pathology is host to wide range of etiologies, resulting in decreased shoulder ROM (External rotation > Abduction > Internal rotation) and increased pain along all aspects of the shoulder joint capsule. Though adhesive capsulitis of the ankle appears to present in a similar fashion, there is currently no clinical criteria to properly diagnose or stage ACA. Today, radiographic arthrograms remain the standard for definitive diagnosis, although their use is limited due to the invasive nature of the procedure. Goldman, et al., defined ACA based on similar arthrogram findings between 3 patients suspected of ACA. With ACA presenting similarly to the pathology seen the shoulder (decreased ROM and increased pain around the involved joint), current treatment options have followed similar suit. Currently, physical therapy, focusing on active and passive range of motion, as well as ankle joint mobilization techniques, is showing to be the most beneficial for patients identified early on. Further controlled studies are needed in order to better properly diagnose and treat ACA. Given the serious lack of literature regarding this condition, more studies are needed and perhaps more rigorous diagnostic criteria to clinically diagnose ACA with more modern radiographic techniques. More importantly, better treatment protocol can be implemented and the possibility of staging the condition would aid physicians in earlier intervention, thereby preventing progression. 1. Tasto J.P., Elias D.W. Adhesive capsulitis. Sports Med Arthrosc Rev 2007 15: 216-221. 2. Rookmoneea, M., Dennis, L., Brealey, S. The effectiveness of interventions in the management of patients with primary frozen shoulder. JBJS 2010 92B: 1267-72. 3. Manske, R.C., Prohaska, D. Diagnosis and management of adhesive capsulitis. Curr Rev Musculoskelet Med 2008 1:180-189. 4. Buchiner R Green, S. Effect of arthrographic shoulder joint distension with saline and corticosteroid for adhesive capsulitis. Br J Sports Med 2004 38:384-385. 5. Lui TH, Chan WK, Chan KB. The arthroscopic management of frozen ankle. J Arthro Rel Surg 2006 22: 283-286. 6. Cui Q, Milbrandt T, Millinton S, Anderson M, Hurwitz S. treatment of posttraumatic adhesive capsulitis of the ankle: A case series. Foot Ankle International 2005 26: 602-606. 7. Banks A. Downey MS. Martin DE, Miller SJ. McGlamry’s Foot & Ankle Textbook 2001 1:3 1095-1097. 8. Goldman, A.B., Katz, M.C. 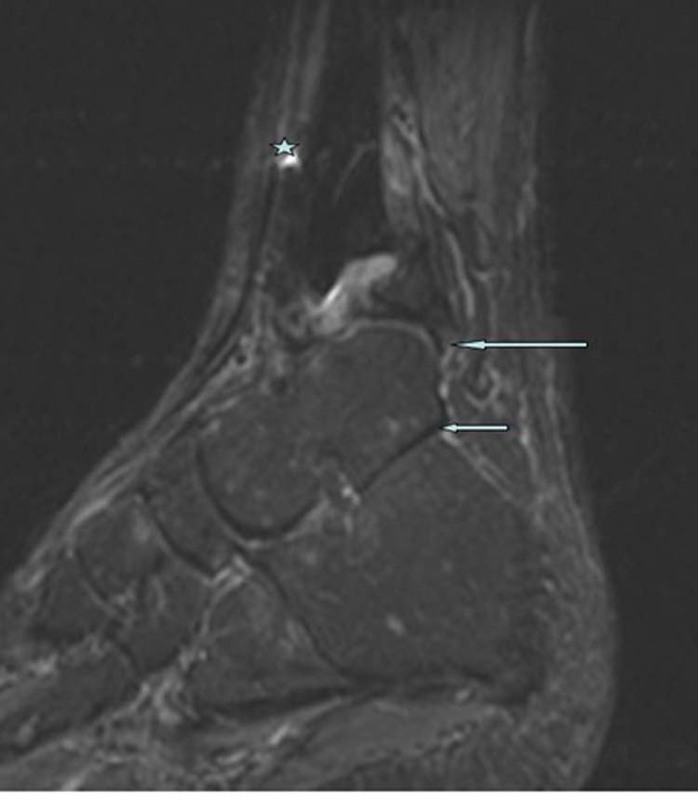 Posttraumatic adhesive capsulitis of the ankle: Arthrographic diagnosis. Am J Roentgenol 1976 127: 585-599. 9. Jung JY, Jee WH, Chun HJ, Kim YS, Chung YG, Kim JM. Adhesive capsulitis of the shoulder: evaluation with MR arthrography. Eur Radiol 2005 16: 791-796. 10. Andrews J, Wilk K, Reinold M. The Athlete’s Shoulder 2008, Churchill Livingstone Press 2: 293-301. 11. Davies GJ, Wilk K, Ellenbecke T, Tyler T, Reinhold M. Current concepts of orthopaedic physical therapy. 2006 (2). The shoulder: physical therapy patient management utilizing current evidence. Orthopedic Section APTA: 38-42. 12. Shaffer MA, Okereke E, Esterhai JL, Elliott MA, Walter GA, Yim SH, Vandenborne K. Effects of immobilization on plantar-flexion torque, fatigue resistance, and functional ability following an ankle fracture. Phys Ther 2000 80:769-780.